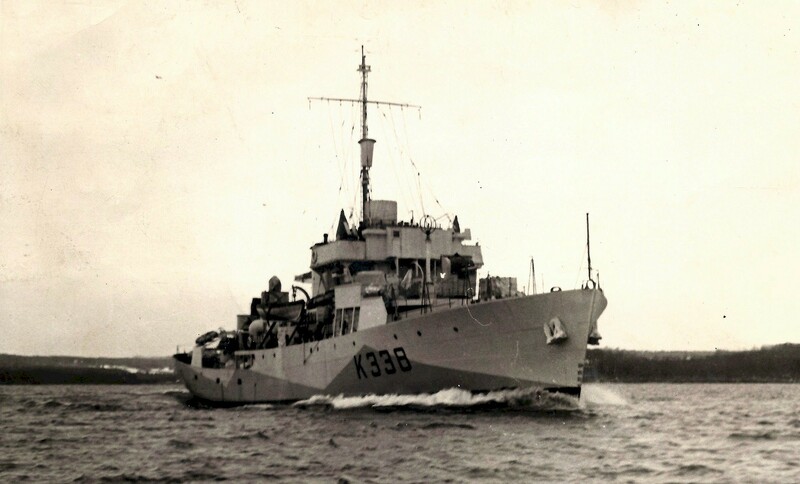 Launched and commissioned at Midland on 15 Nov 1943, Lindsay arrived at Halifax in Dec 1943 and late in Jan 1944, sailed to Bermuda for three weeks' workups. 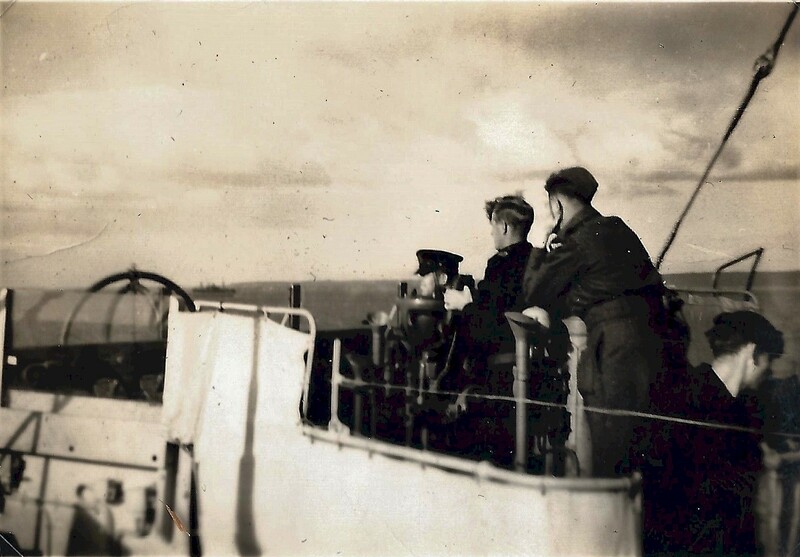 Upon her return she was briefly attached to EG W-5, but left Halifax on 23 Apr 1944 to join Western Approaches Command at Londonderry. 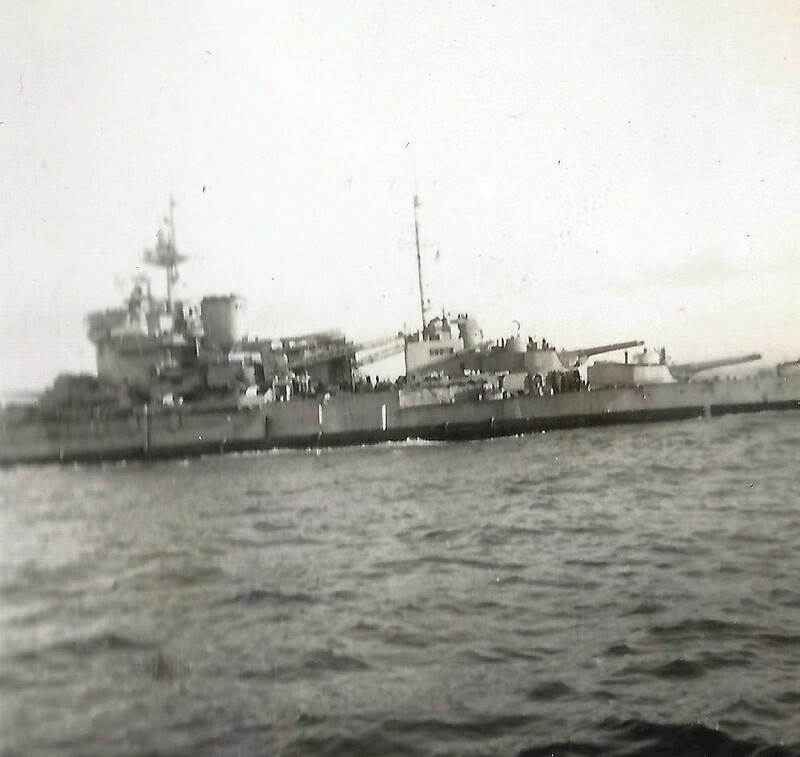 For the next four months she served in U.K. waters, taking part in the D-Day invasion, as an unallocated unit. 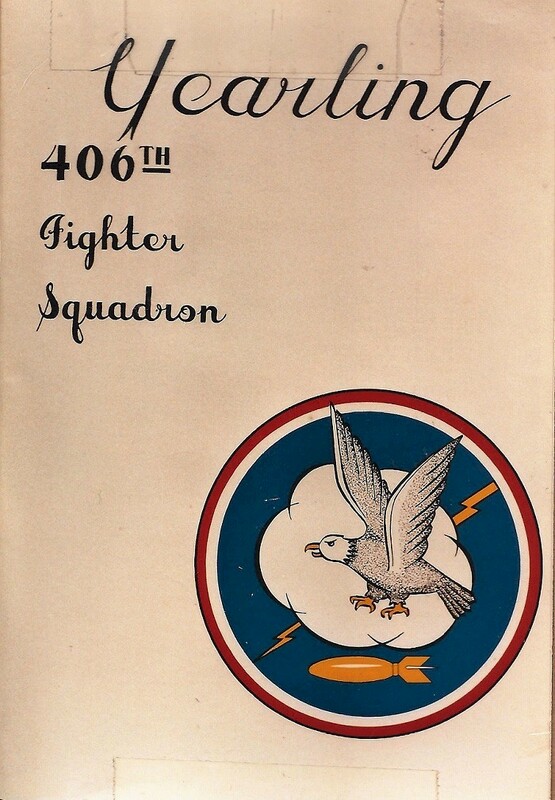 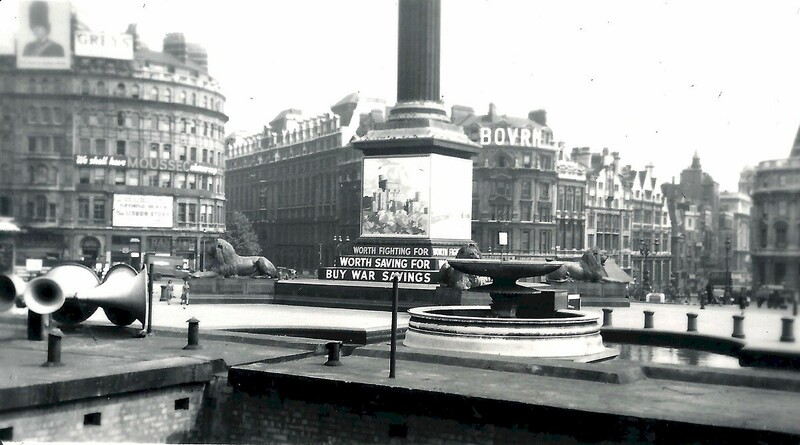 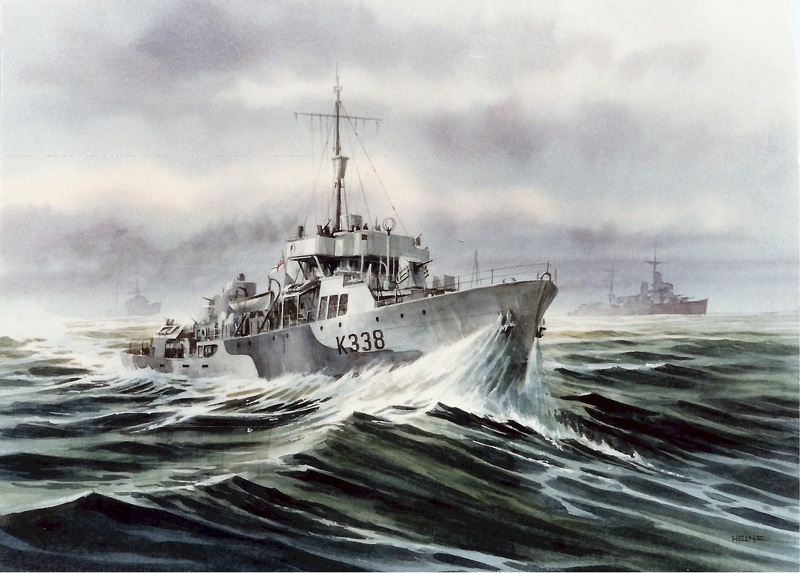 In Sep 1944, she joined the RN's EG 41, Plymouth Command, for service in the Channel. 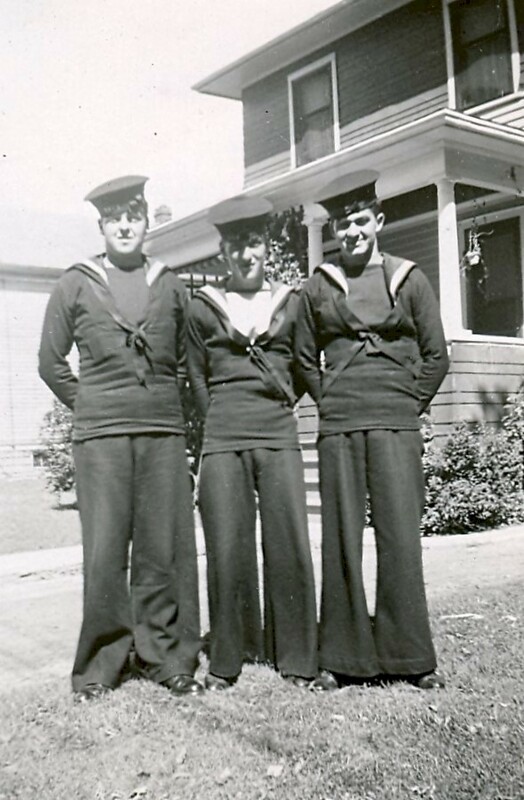 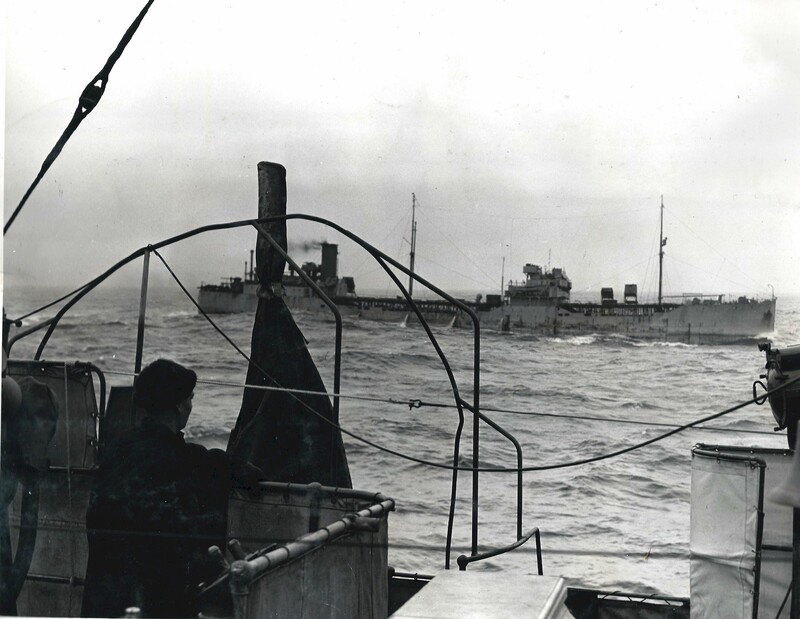 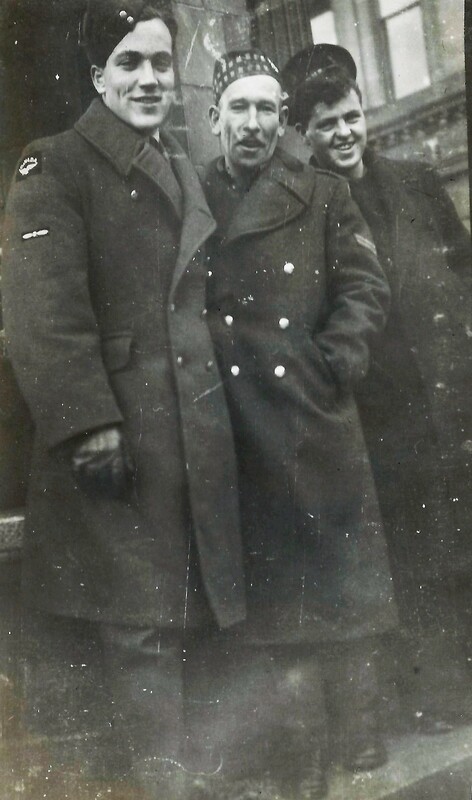 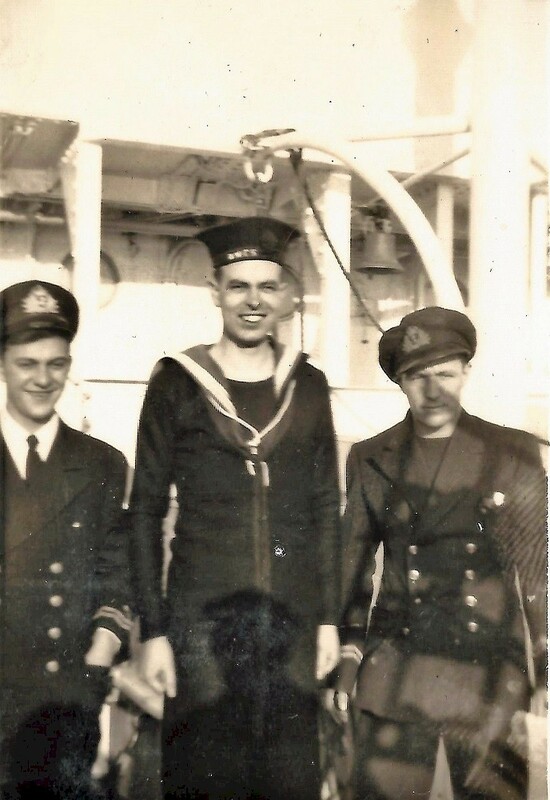 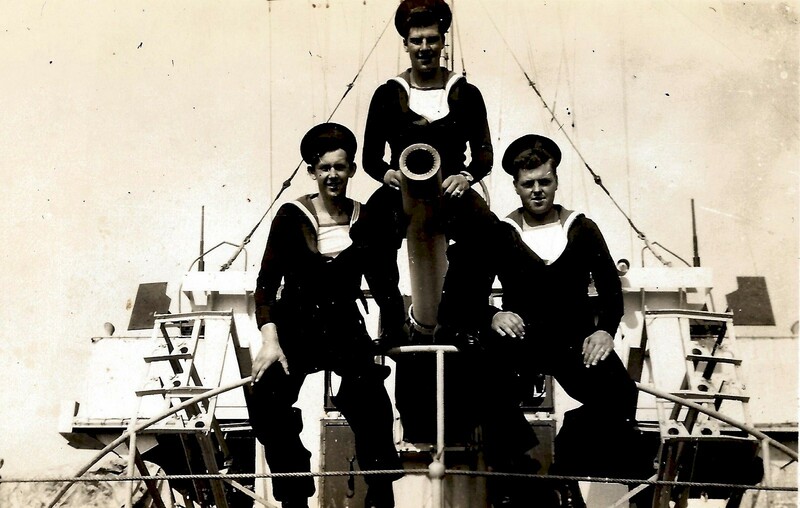 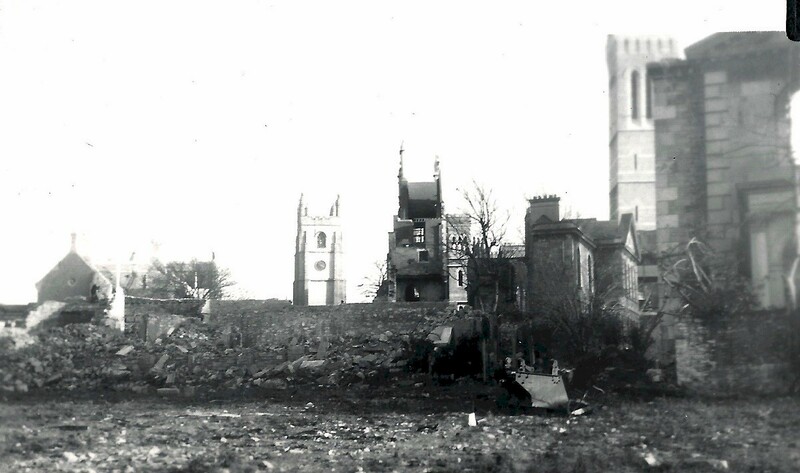 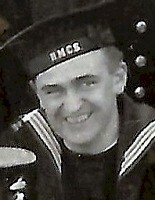 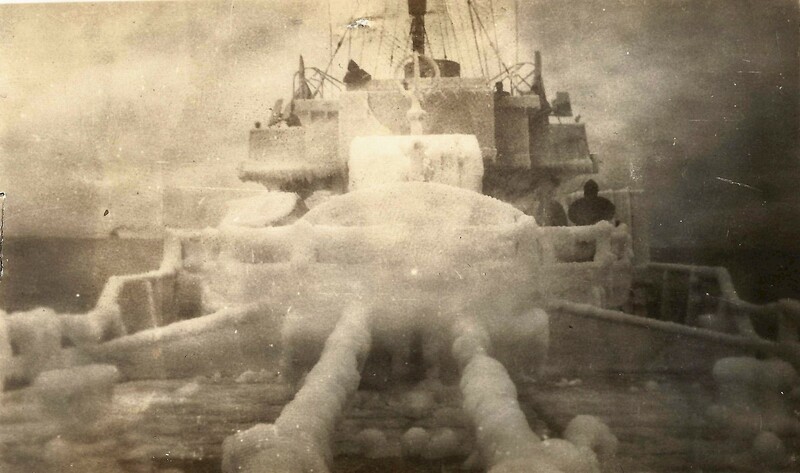 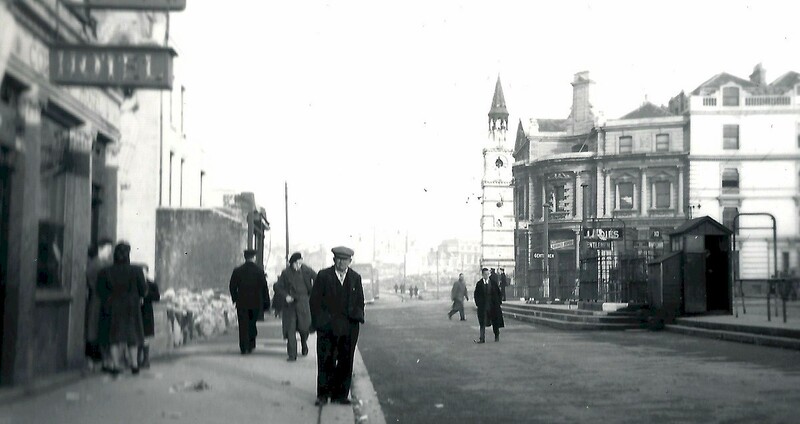 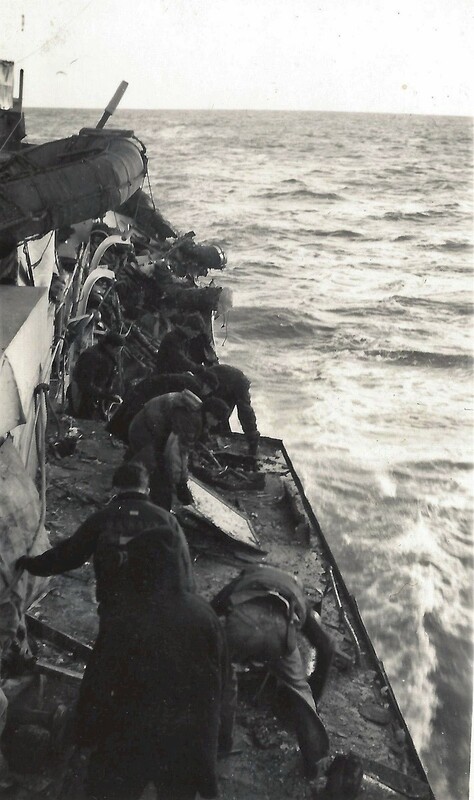 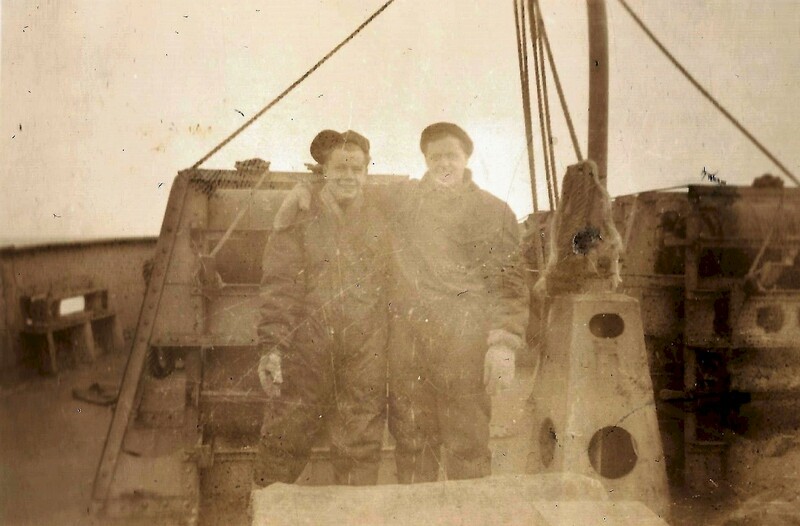 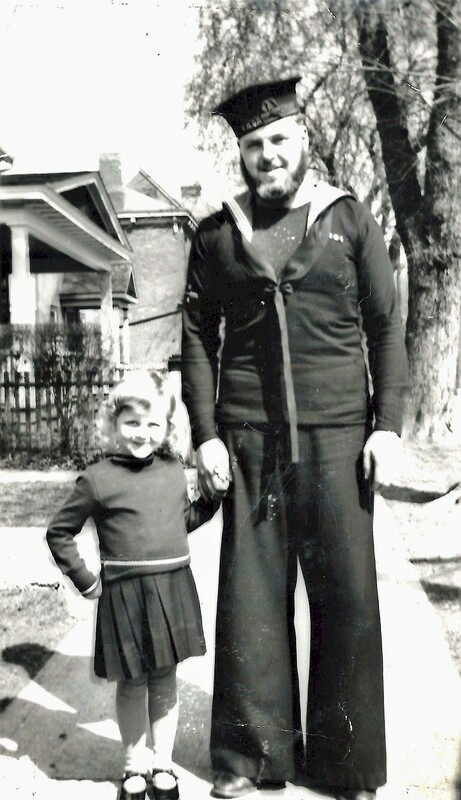 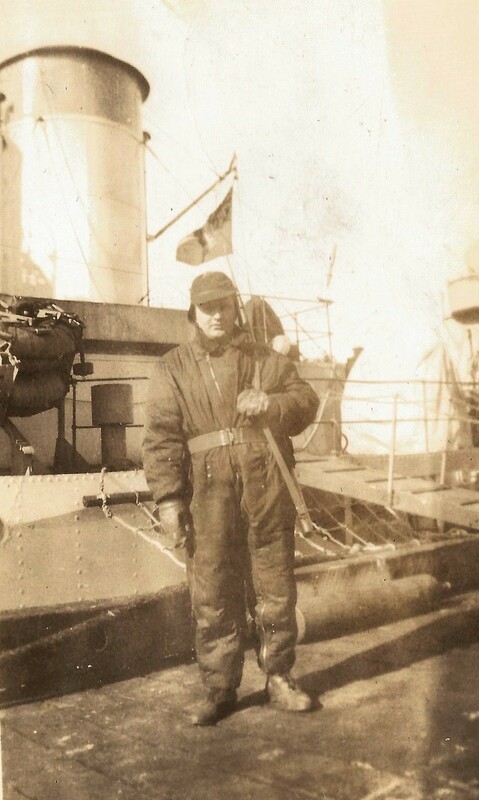 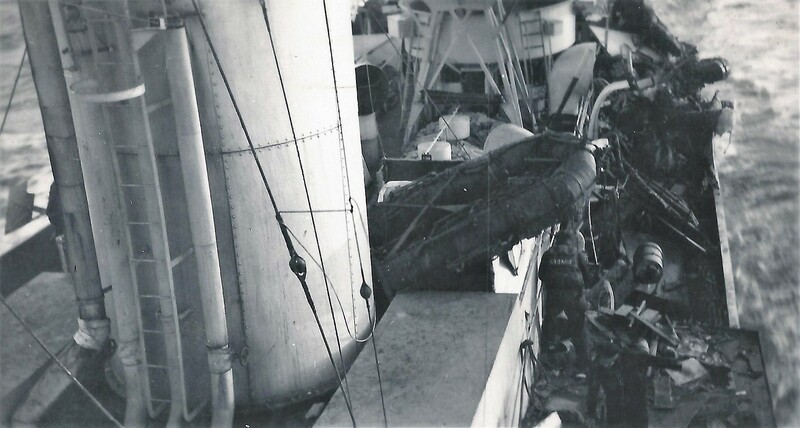 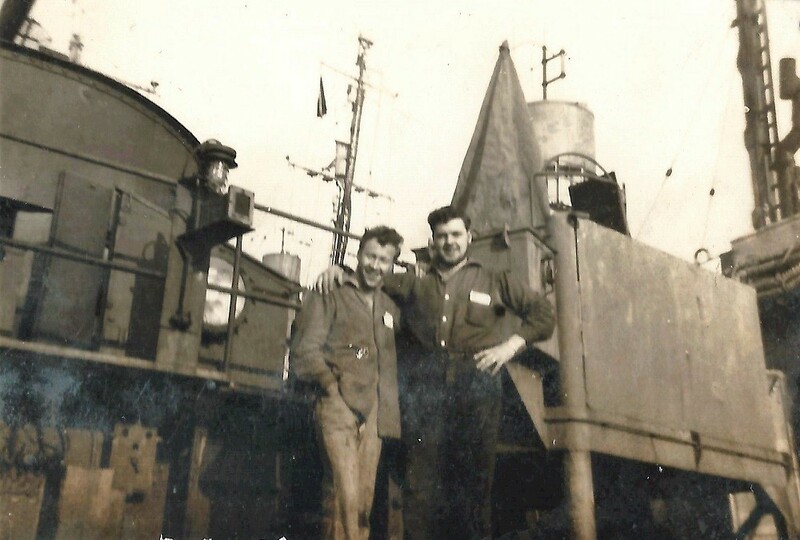 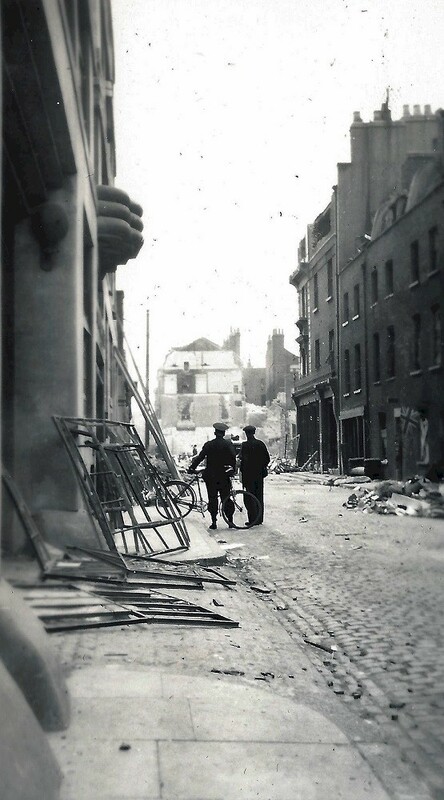 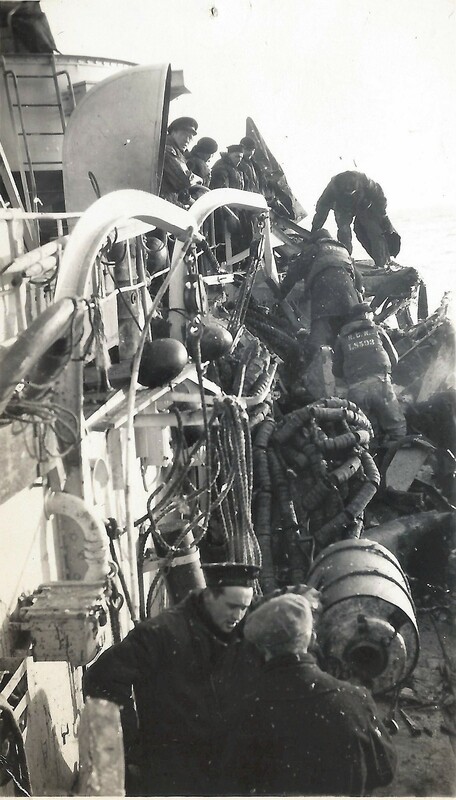 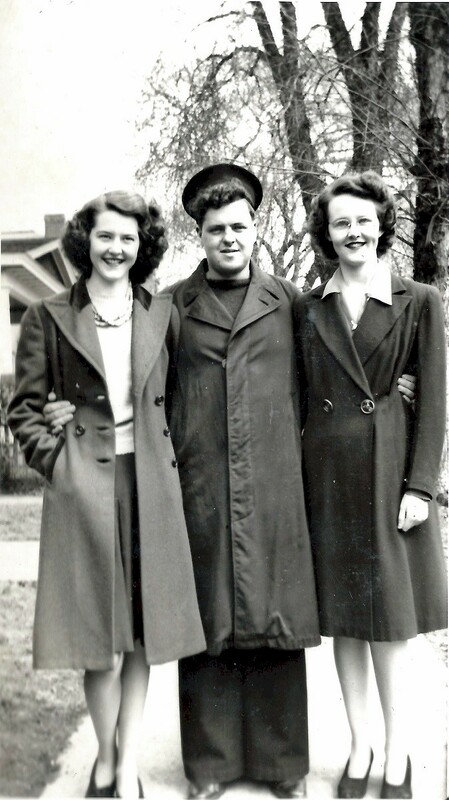 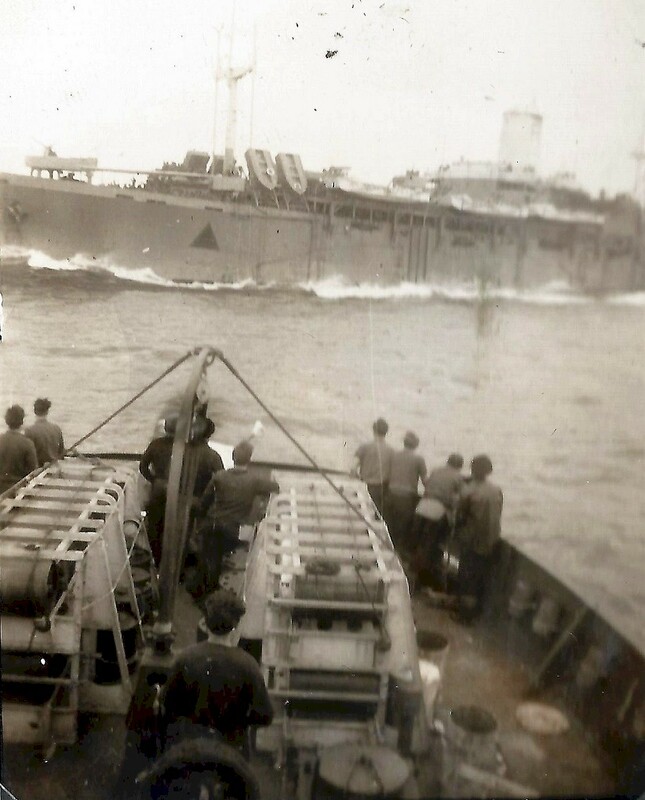 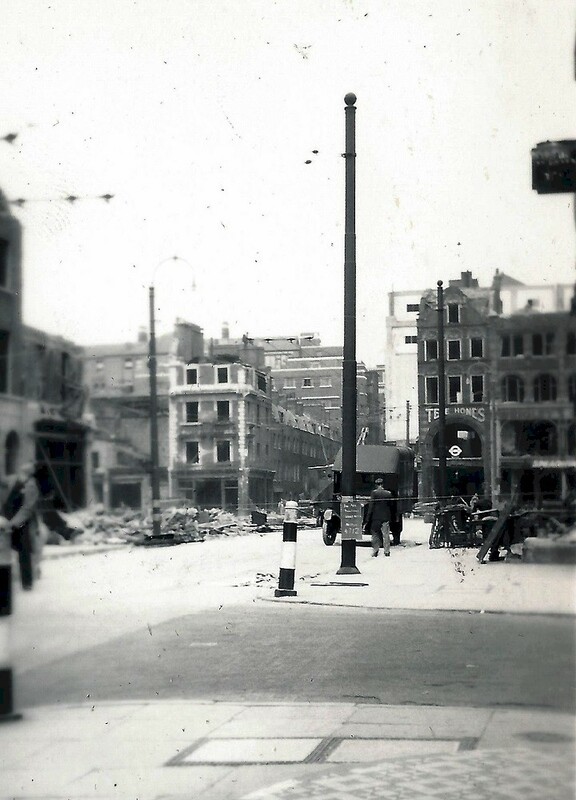 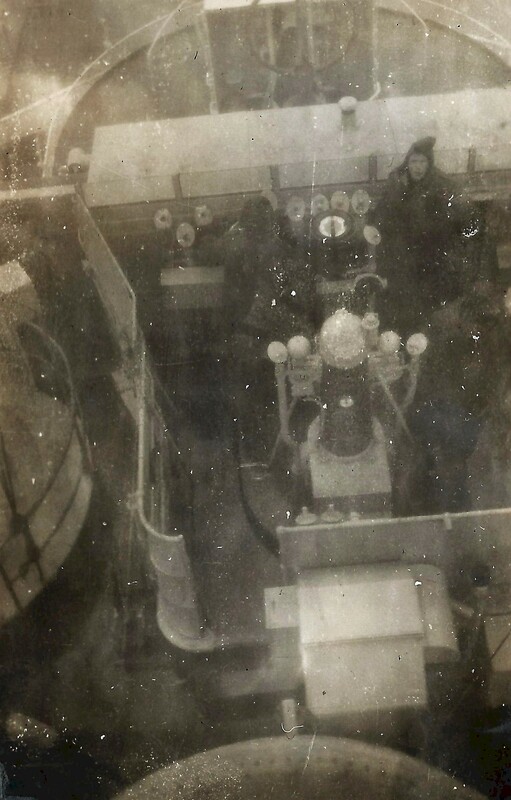 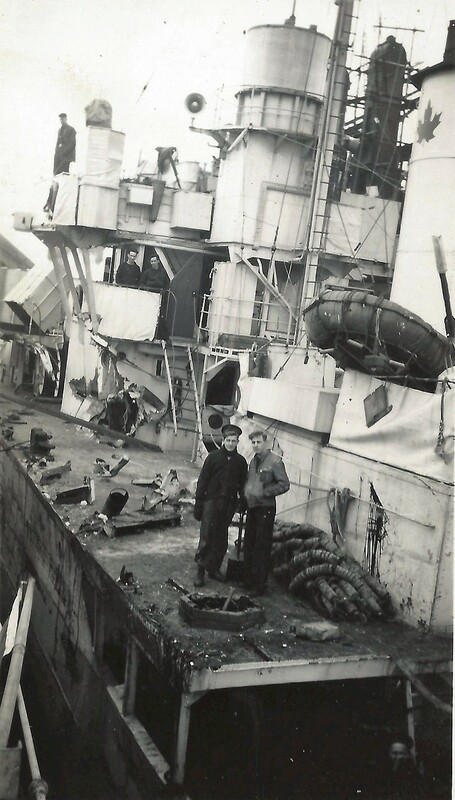 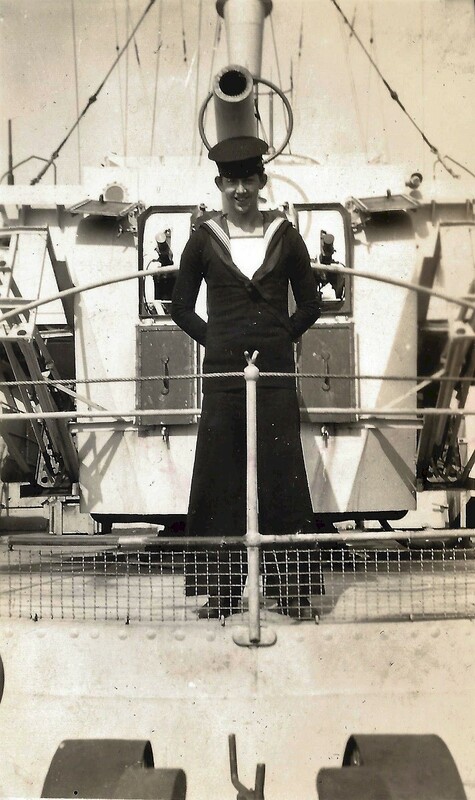 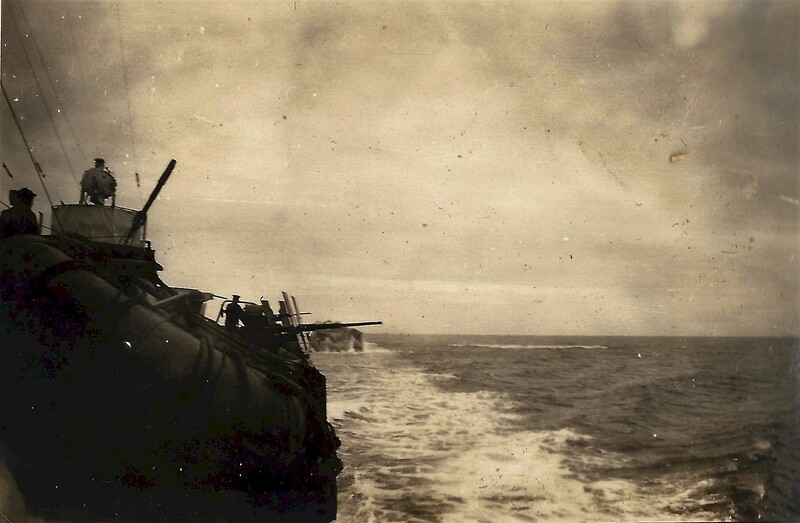 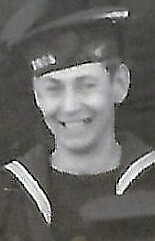 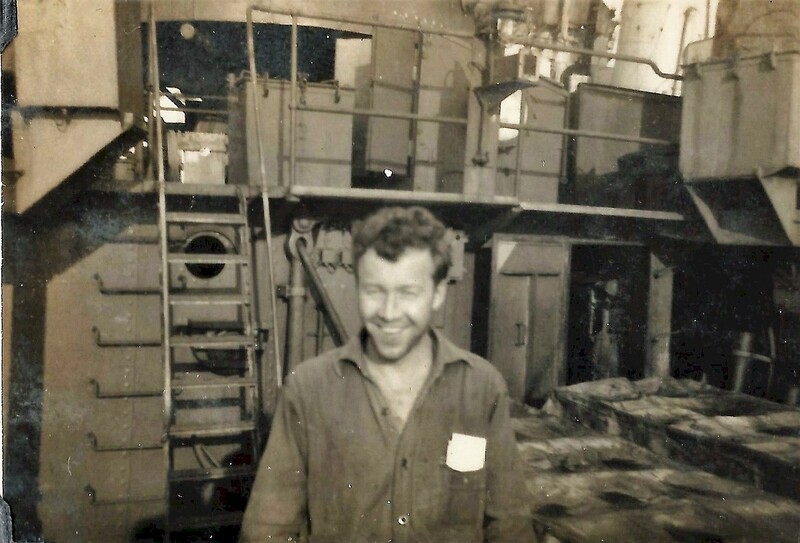 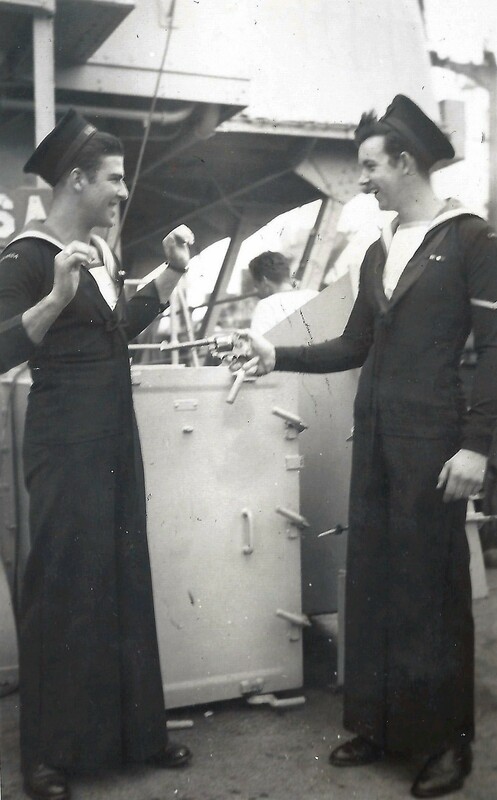 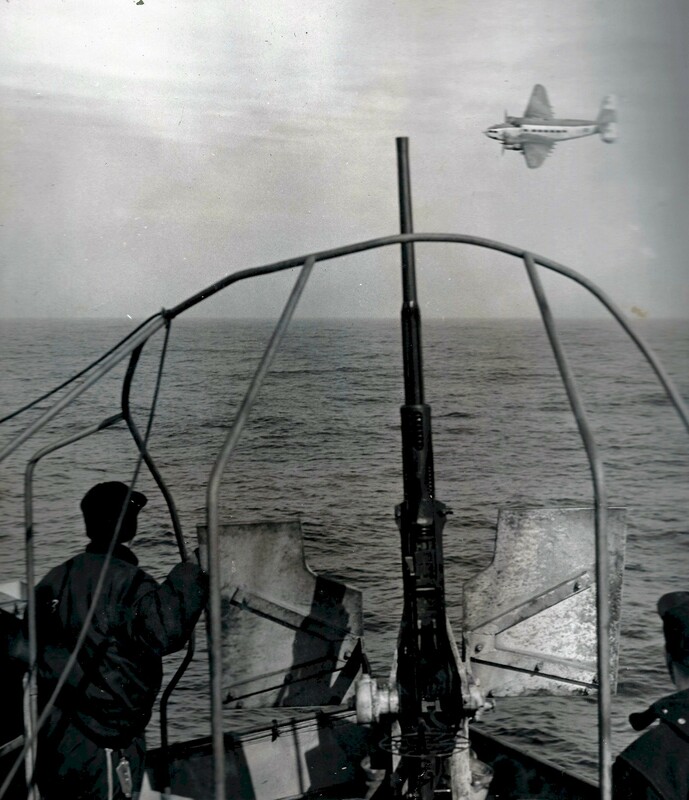 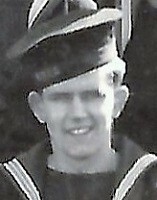 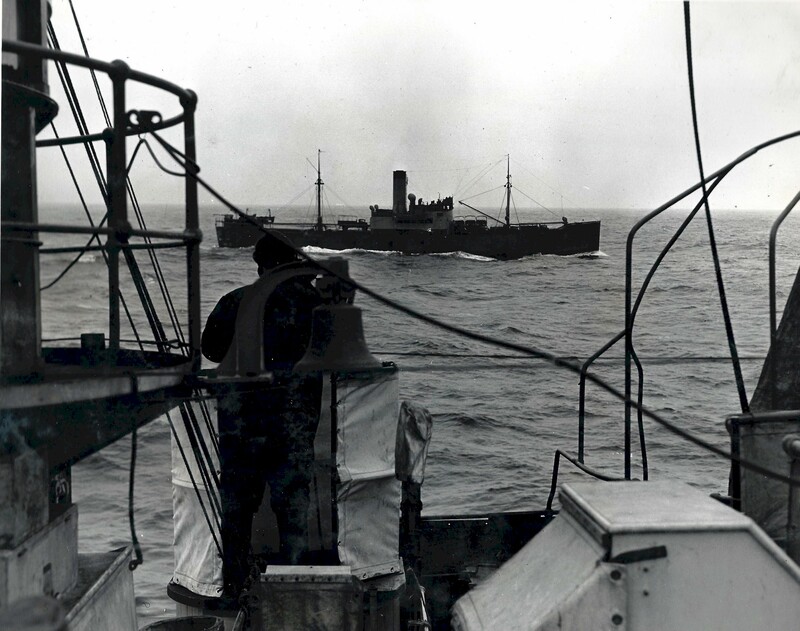 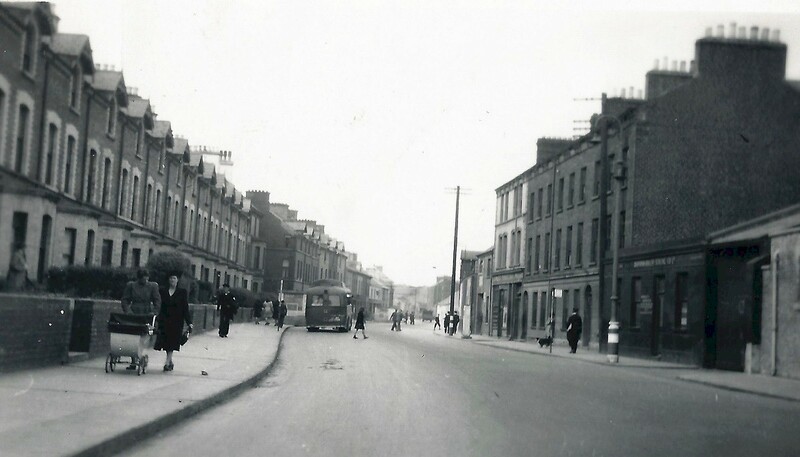 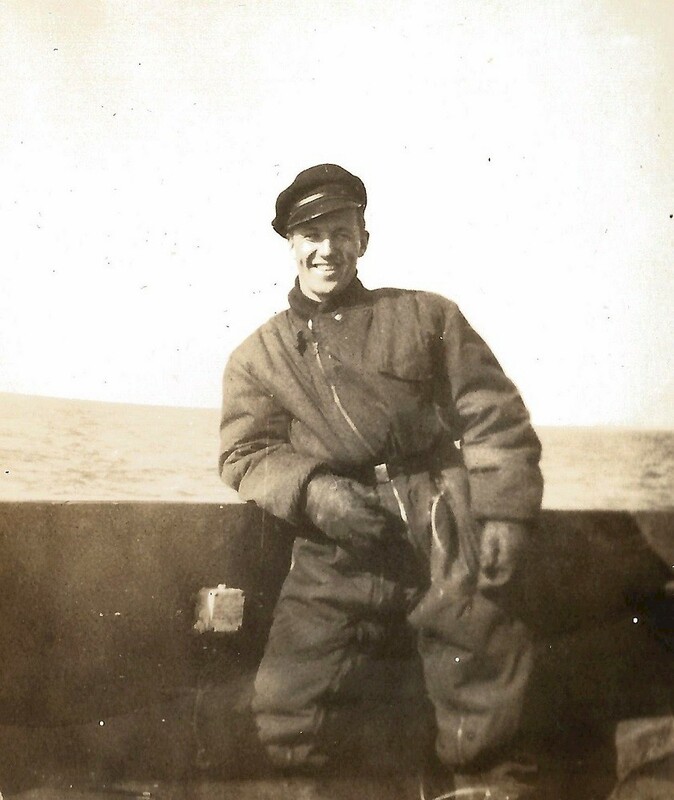 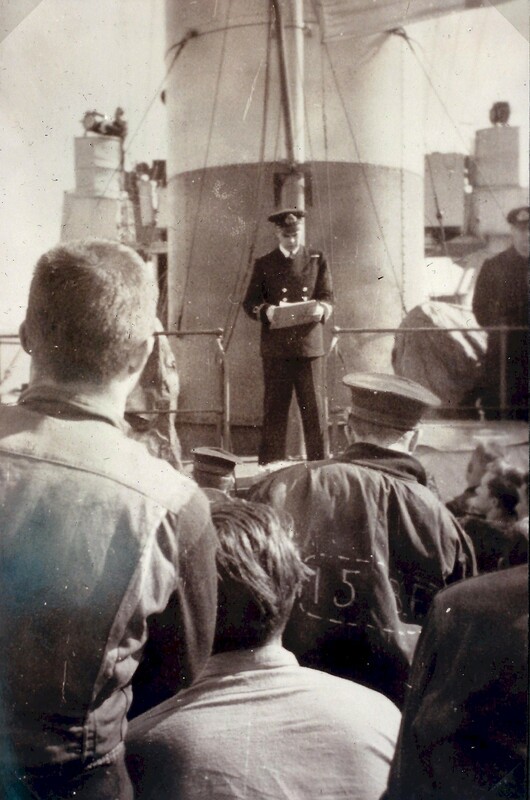 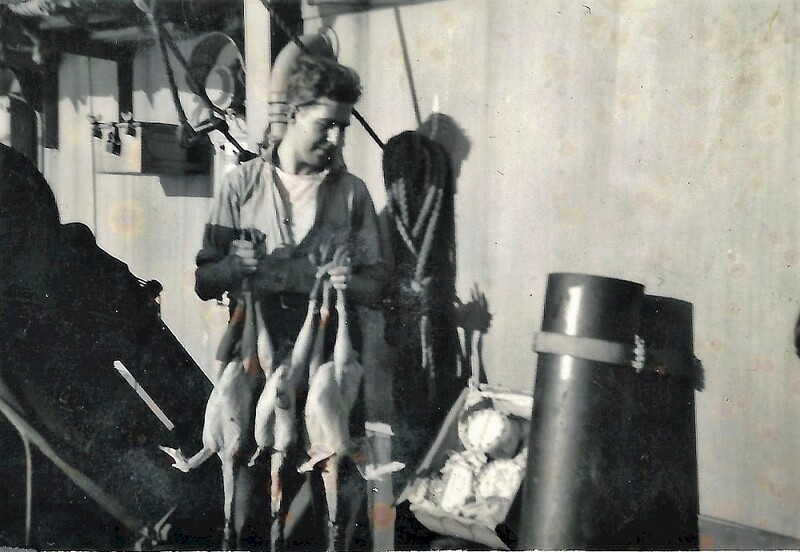 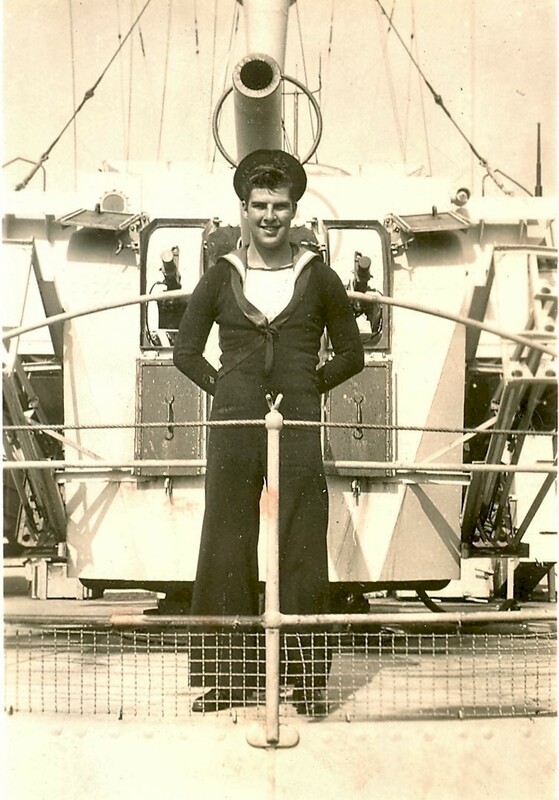 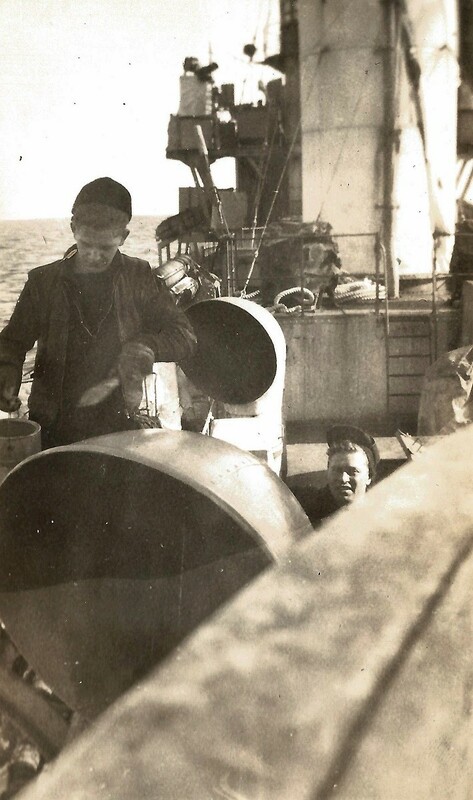 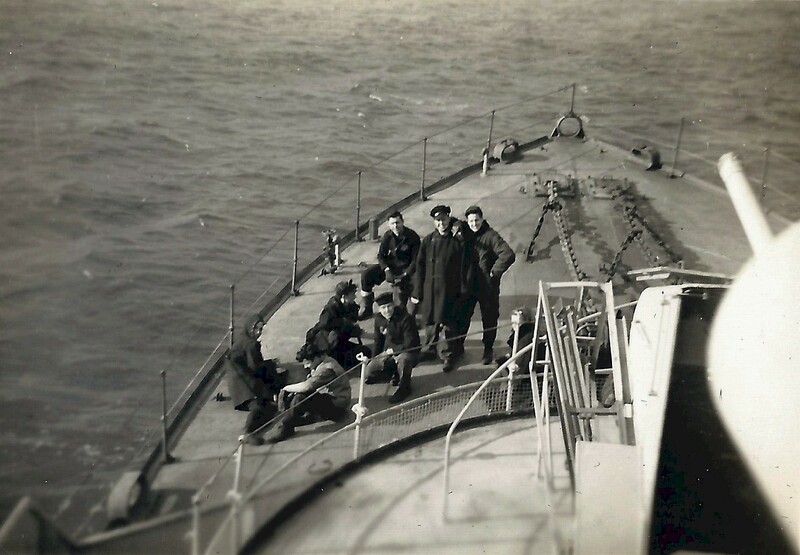 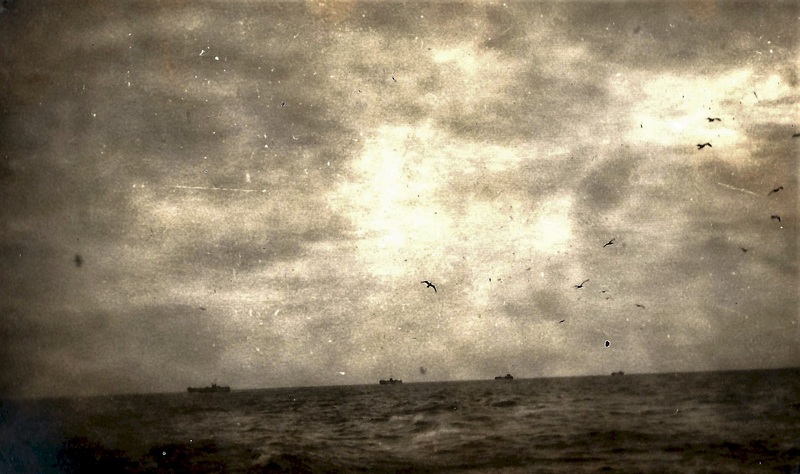 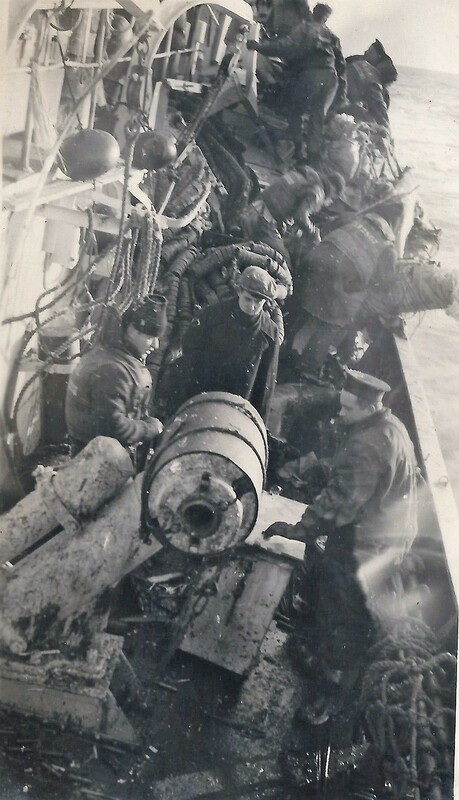 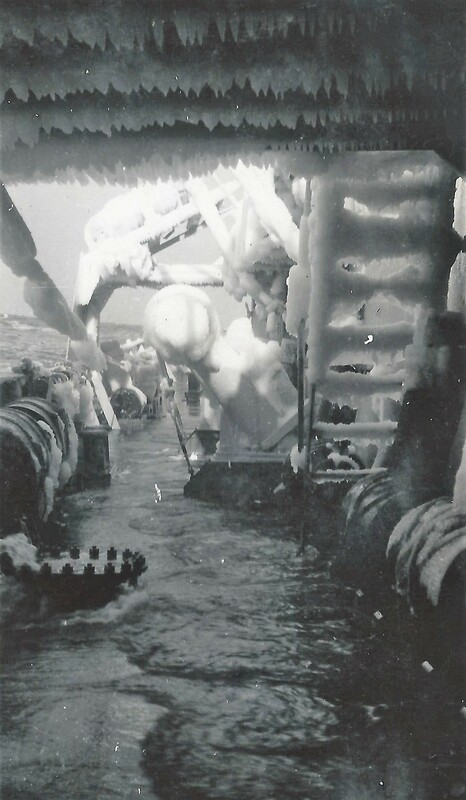 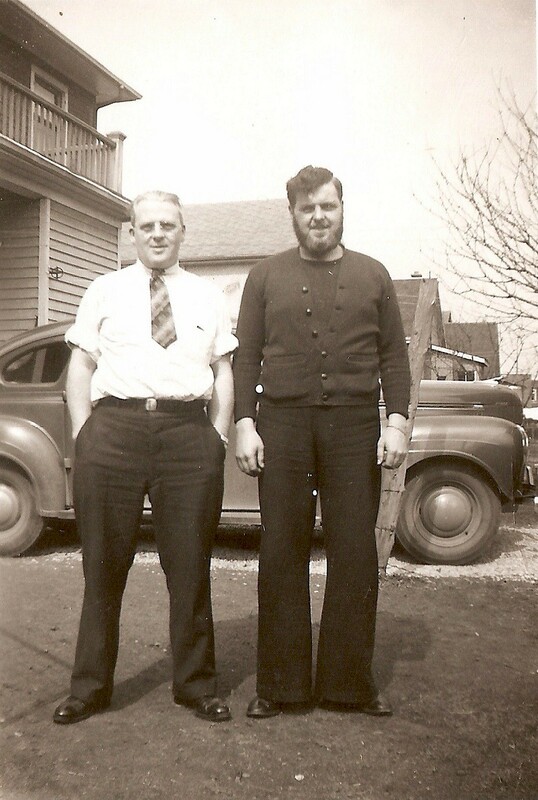 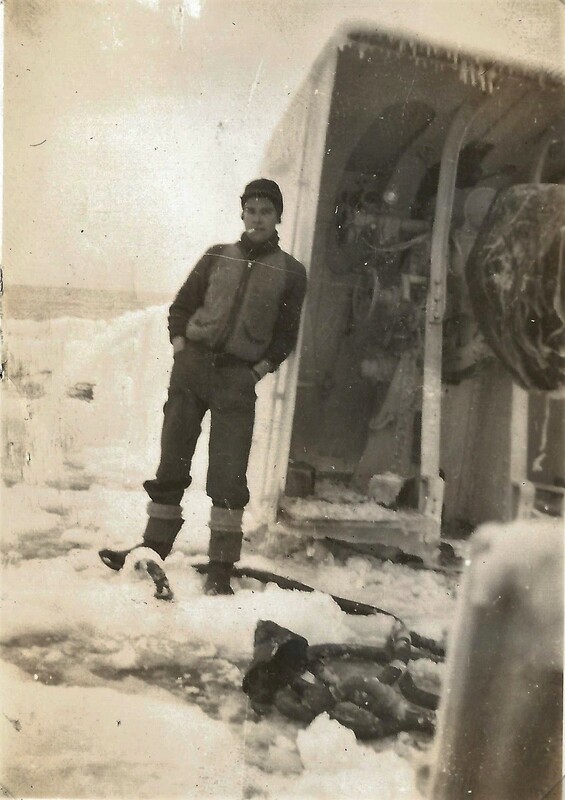 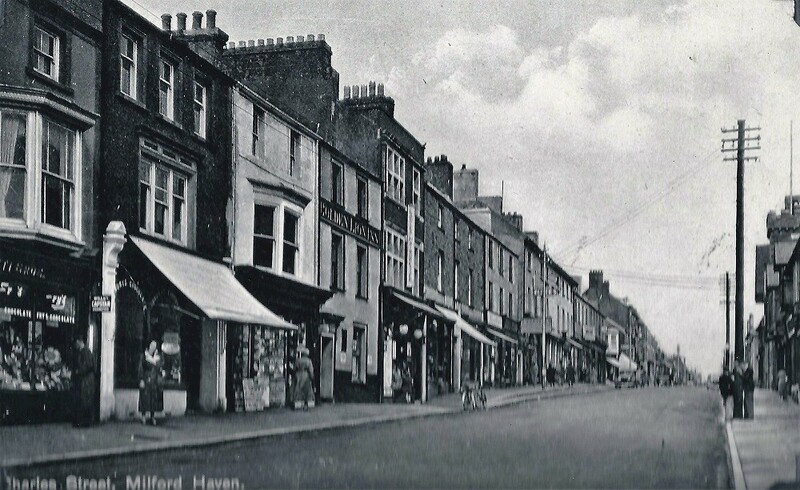 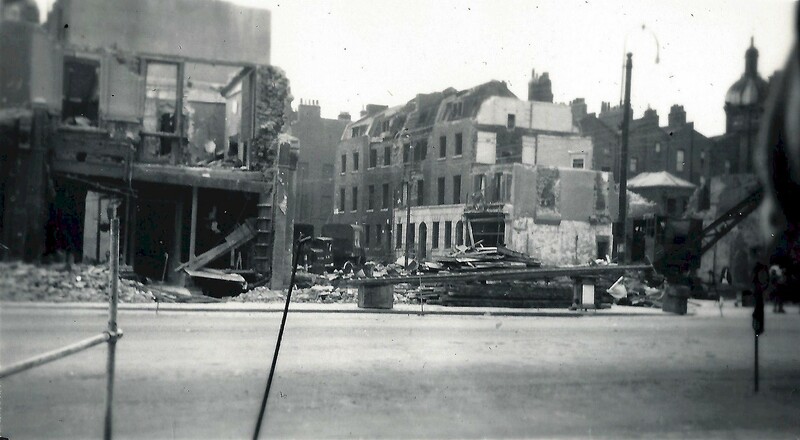 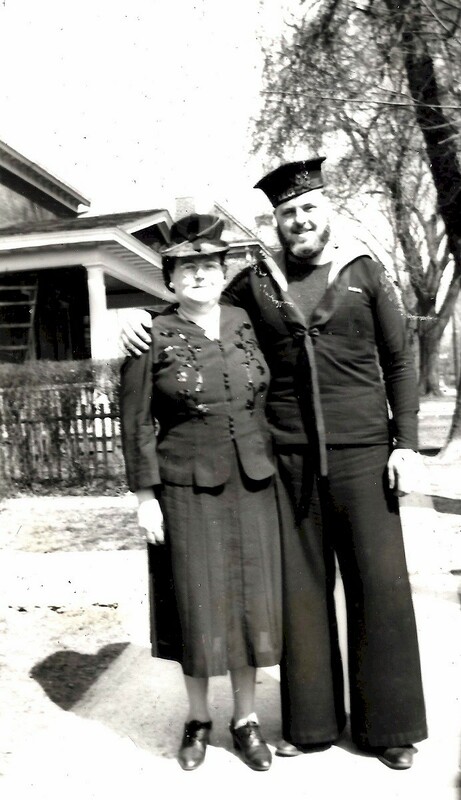 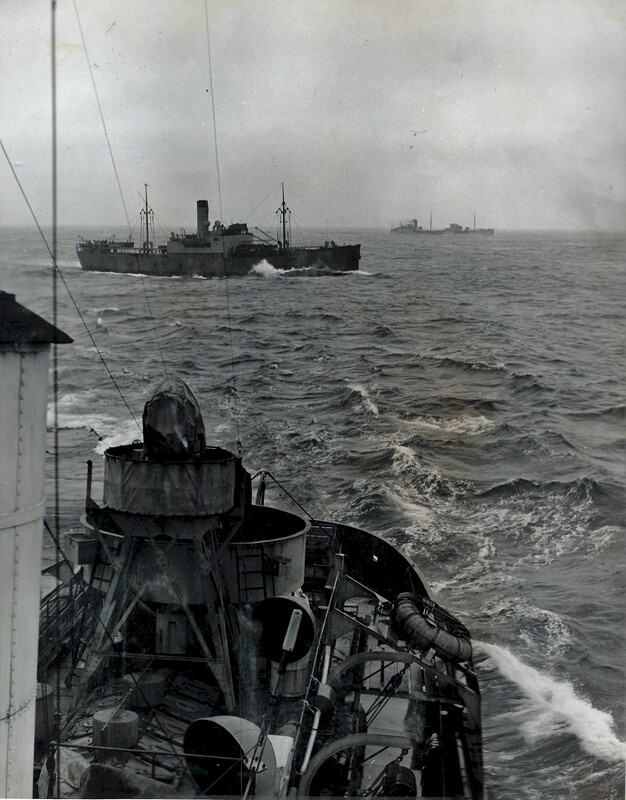 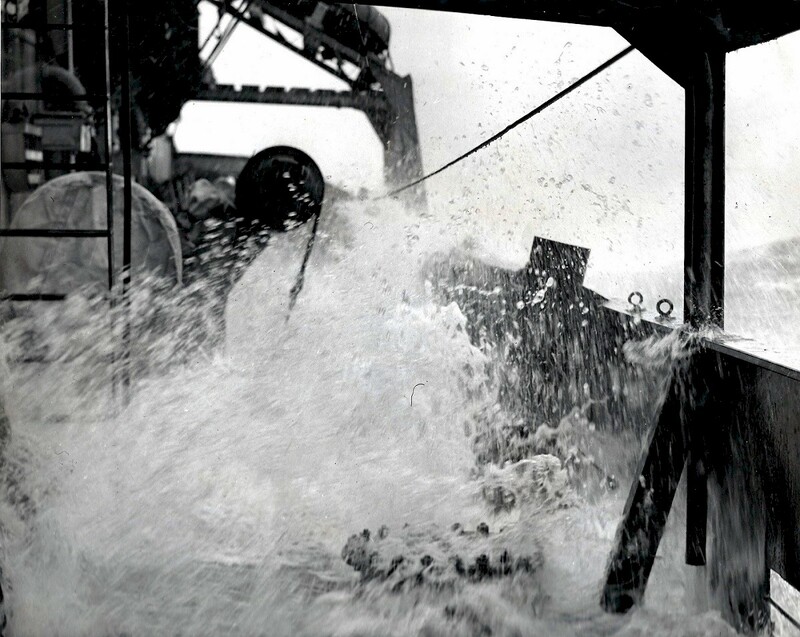 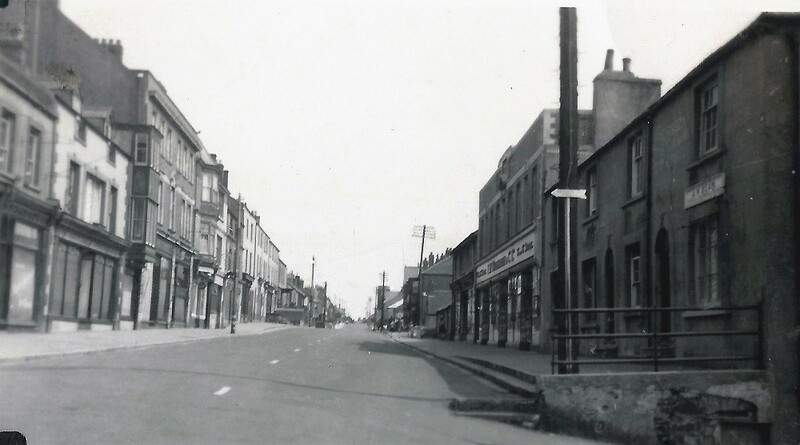 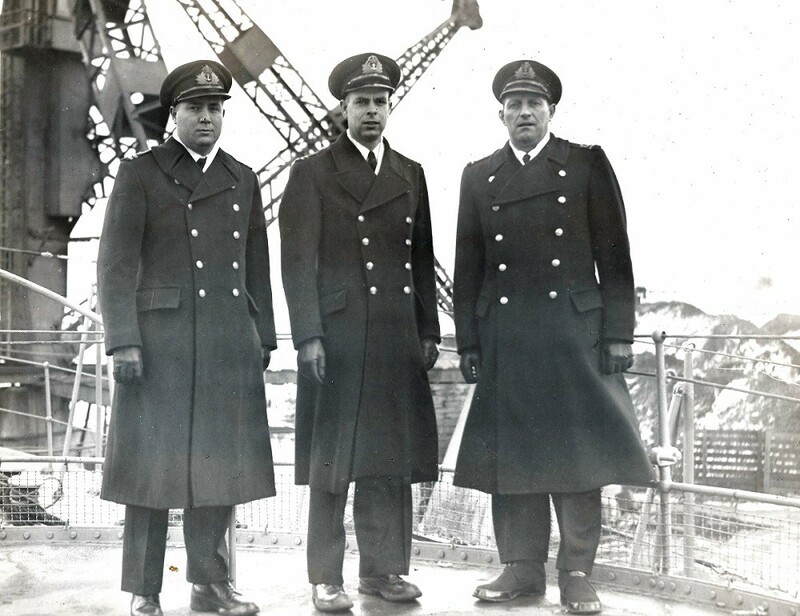 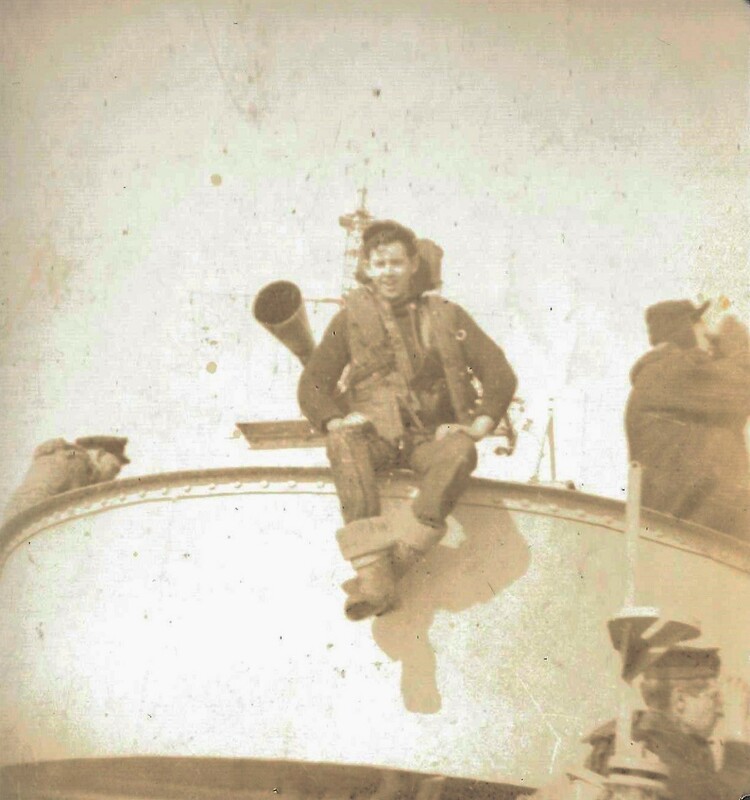 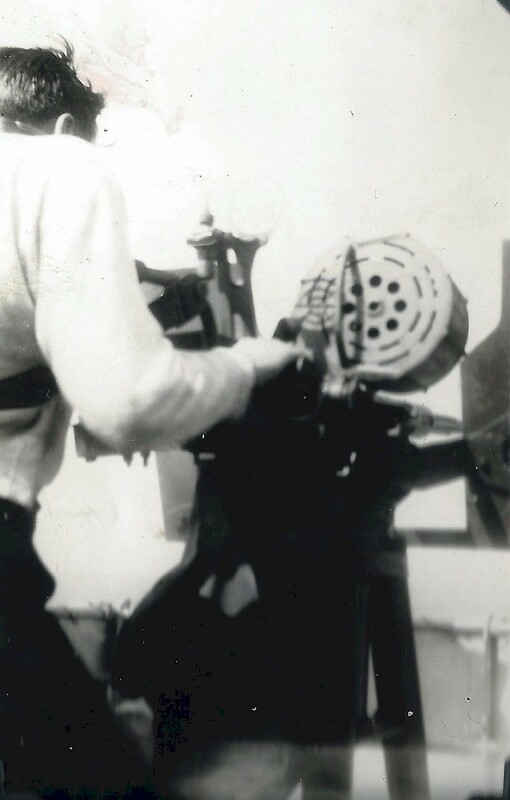 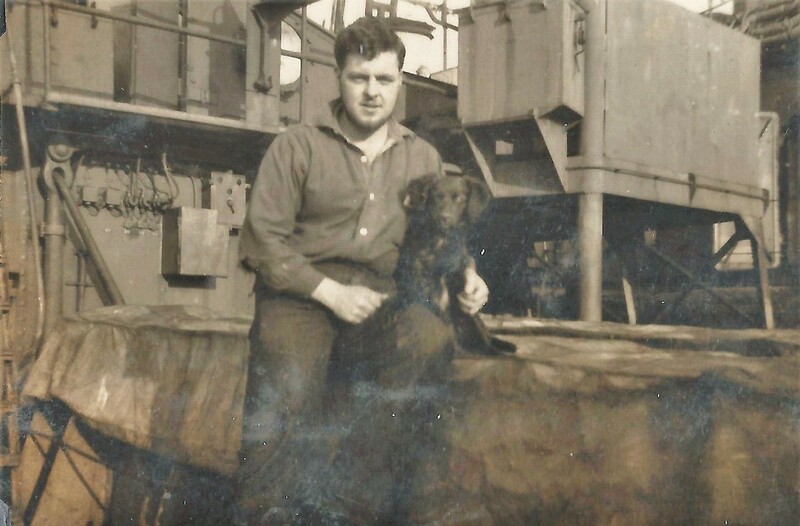 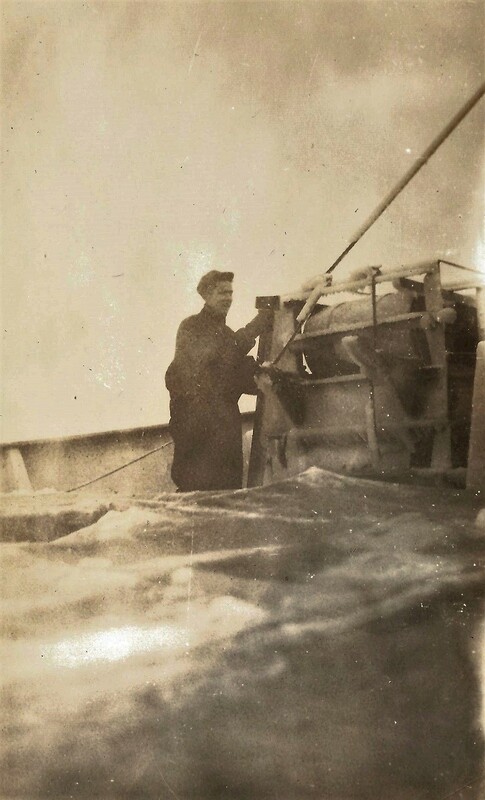 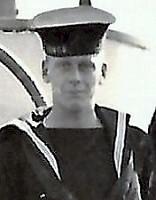 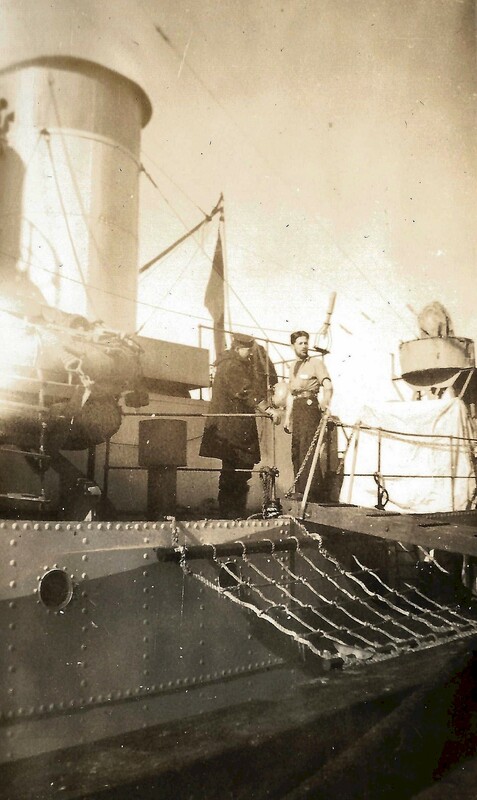 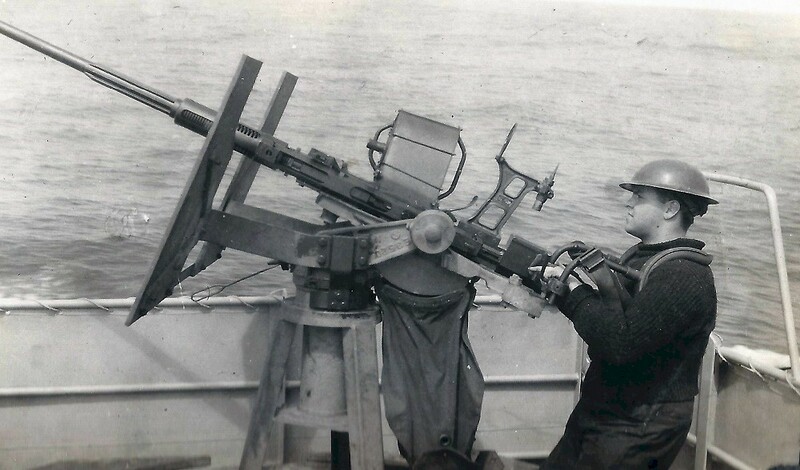 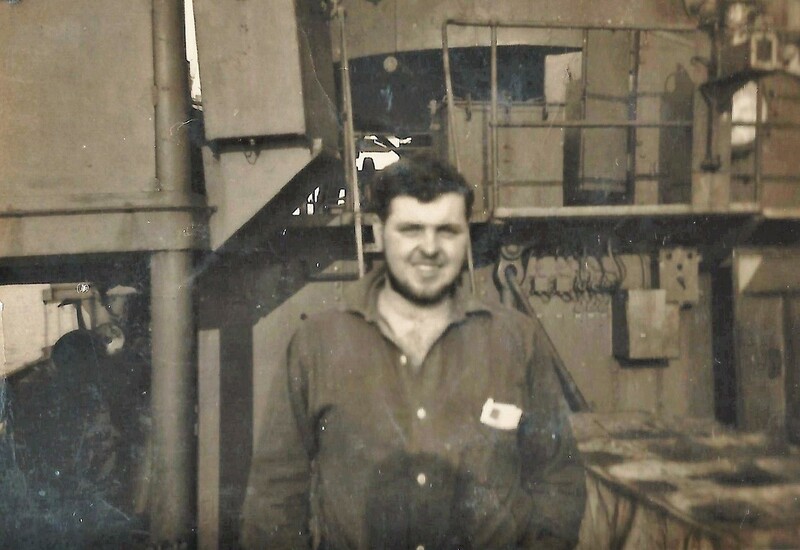 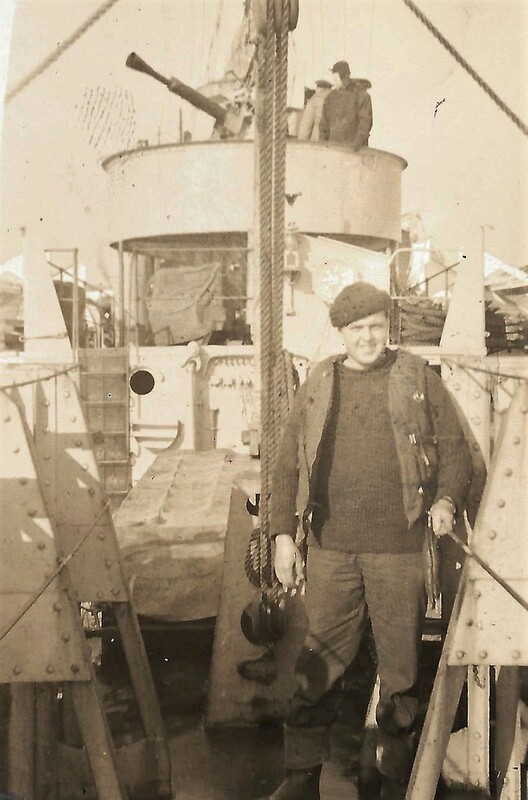 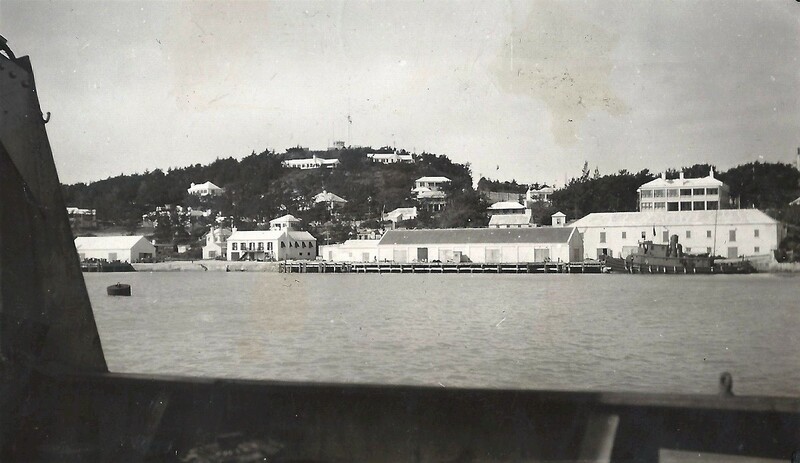 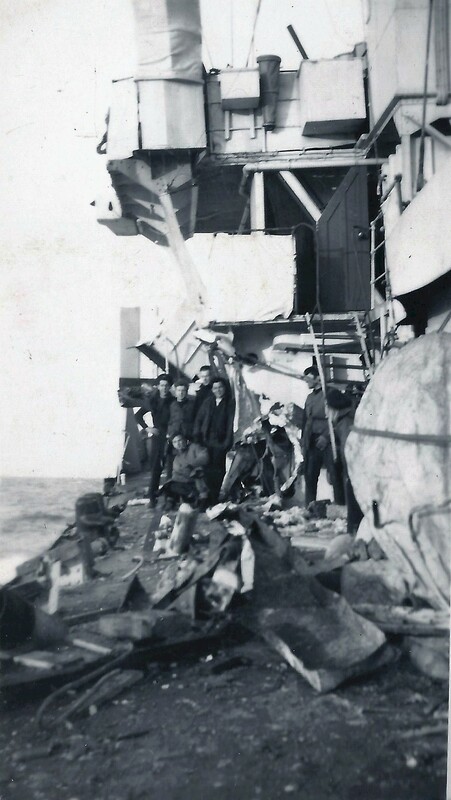 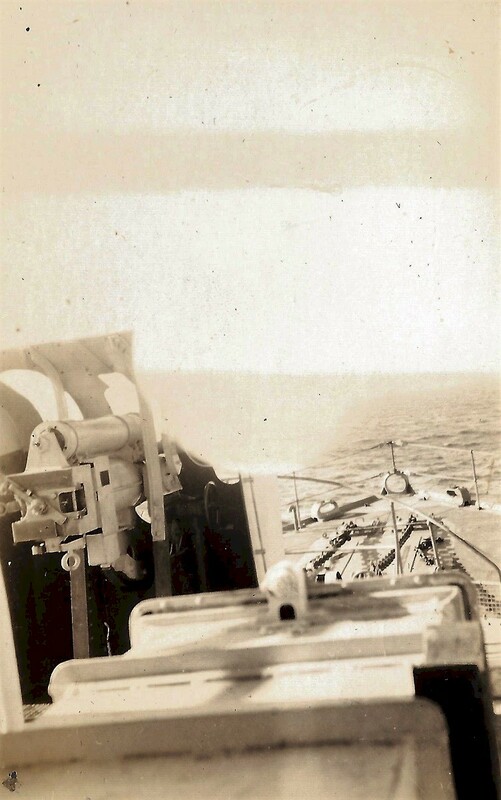 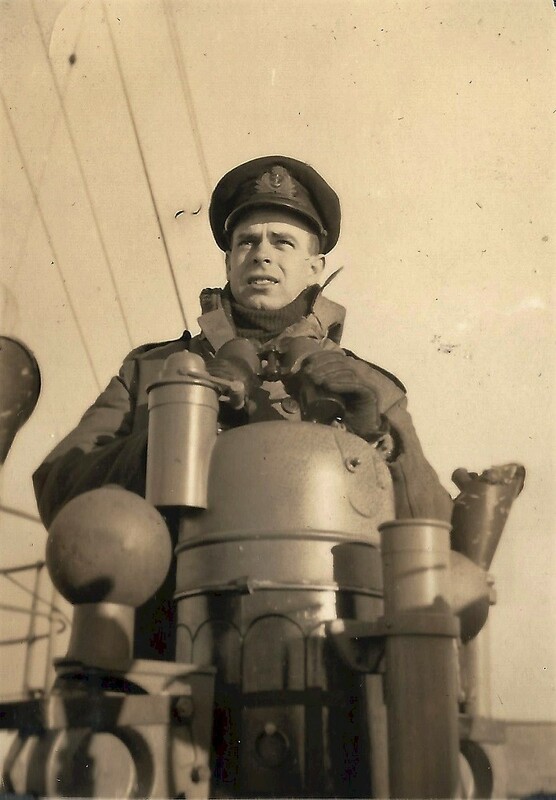 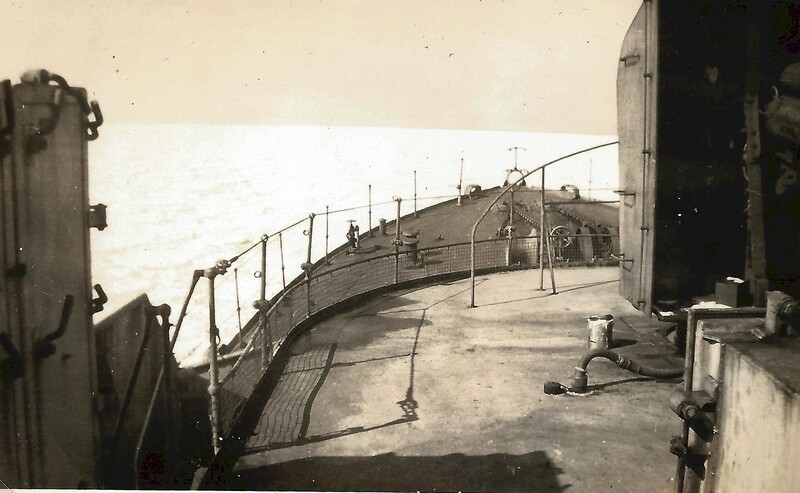 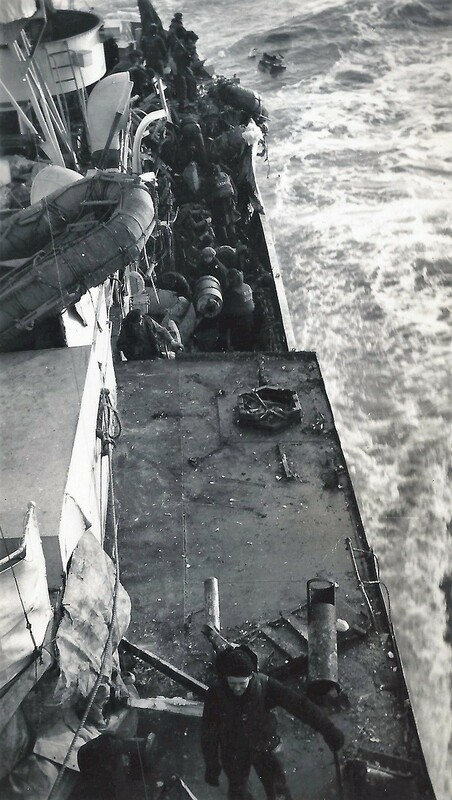 On Saturday May 20th 1944 at 04:50 hrs while sailing back to Londonderry from Larne at 12 knots in line with HMCS Port Arthur, HMCS Trentonian, HMCS Alberni (Senior Officer), and HMCS Lindsay, last in the column - HMCS Lindsay was involved in a collision with a civilian fishing trawler, the St. Springwell. 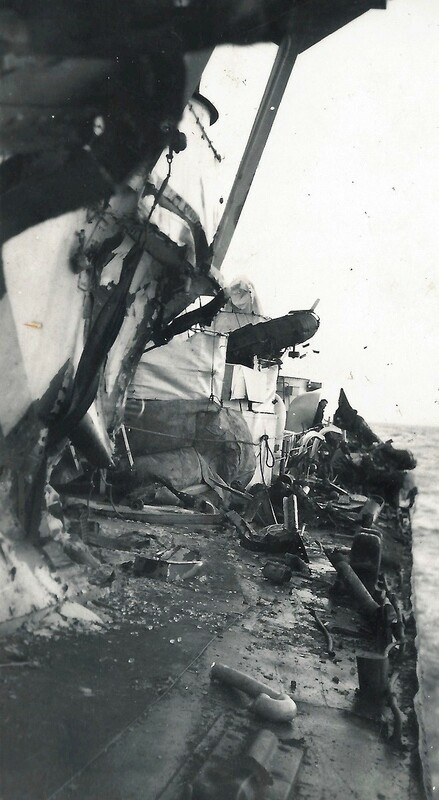 Damage was minimal. 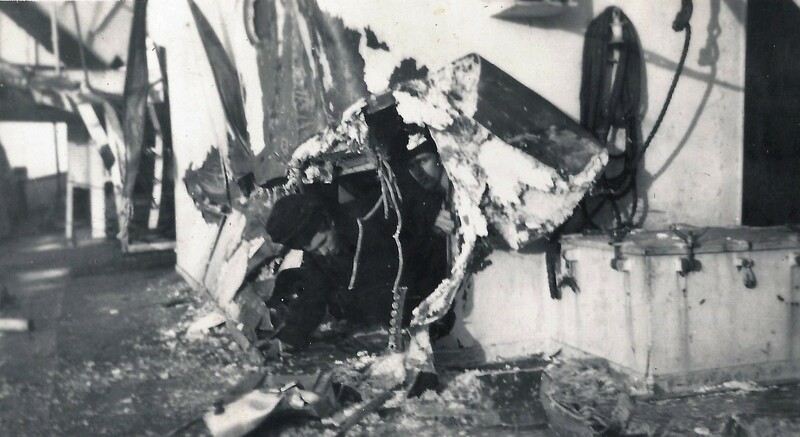 Springwell was found totally responsible. 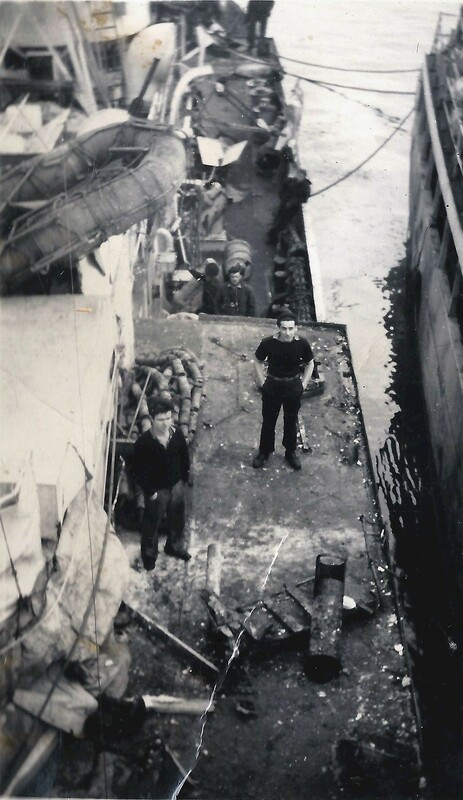 The owners of the trawler attempted to sue for damages but later dropped the suit due to impending travel and witness costs. 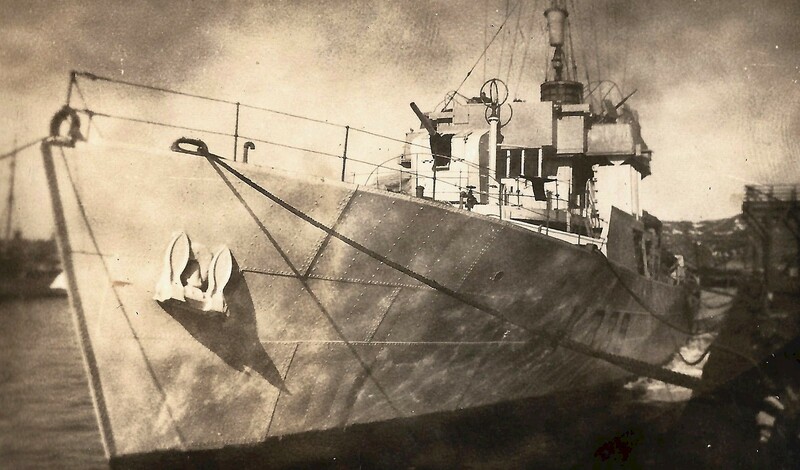 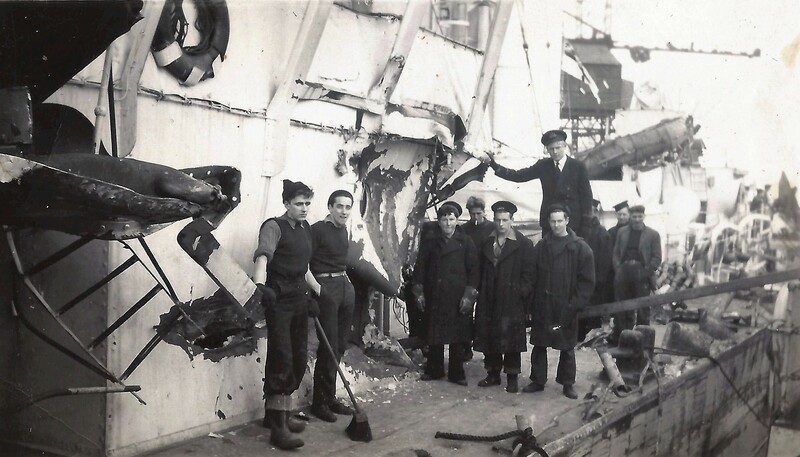 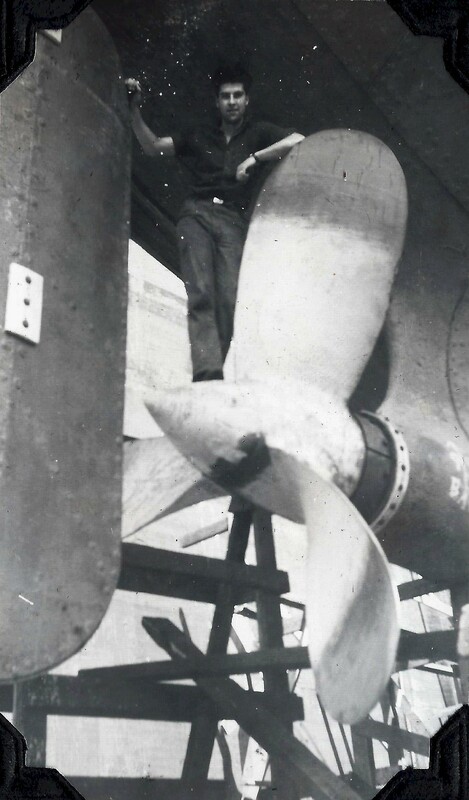 (1) In Aug 1944, HMCS Lindsay went into drydock in Milford Haven, South Wales, to have the damage to her bow from her collision with St. Springwell repaired. 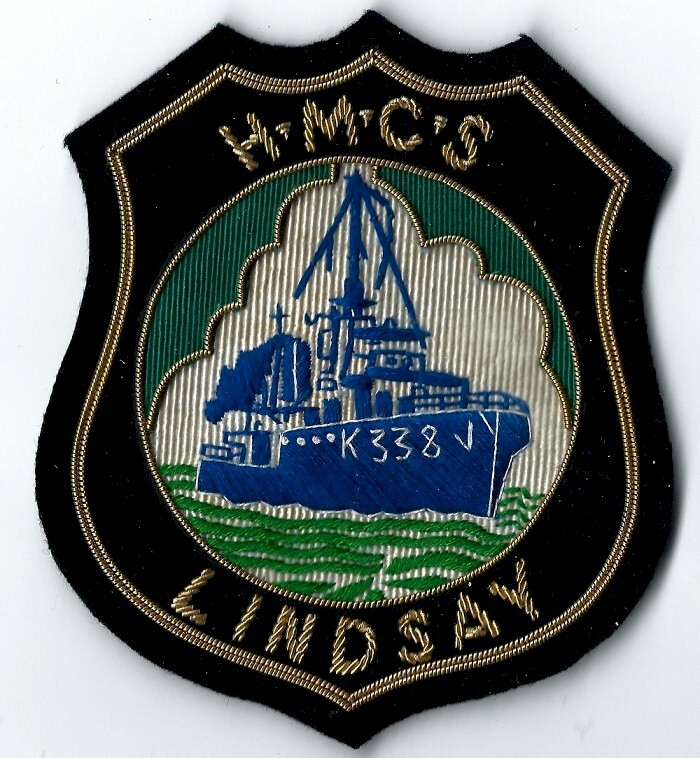 On 22 Jan 1945, HMCS Lindsay was damaged in collision with HMS Brilliant southwest of the Isle of Wight. 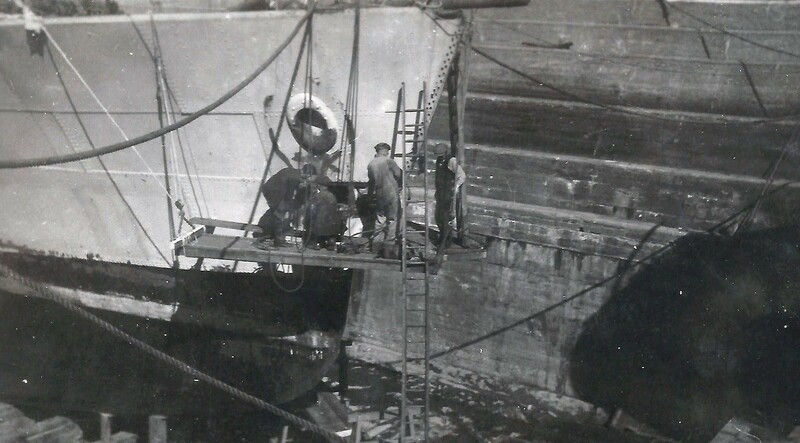 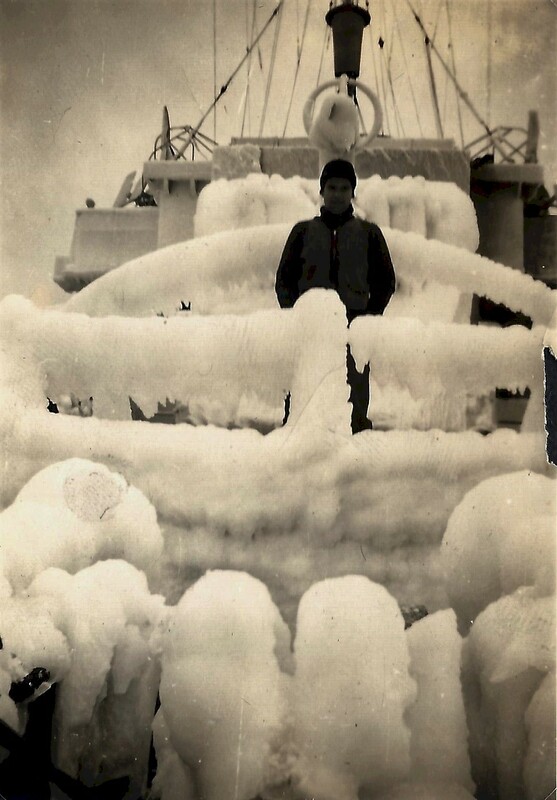 Following temporary repairs at Davenport from 22 Jan to 19 Feb 1945, she sailed for Canada via Londonderry, arriving at Halifax early in Mar 1945. 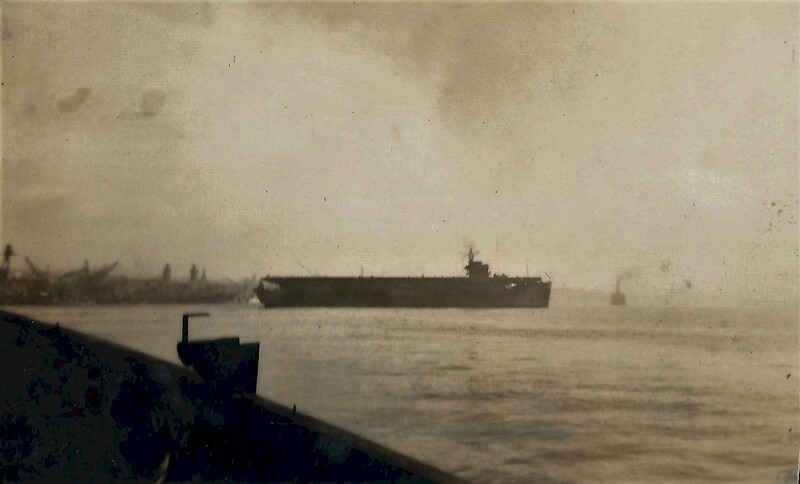 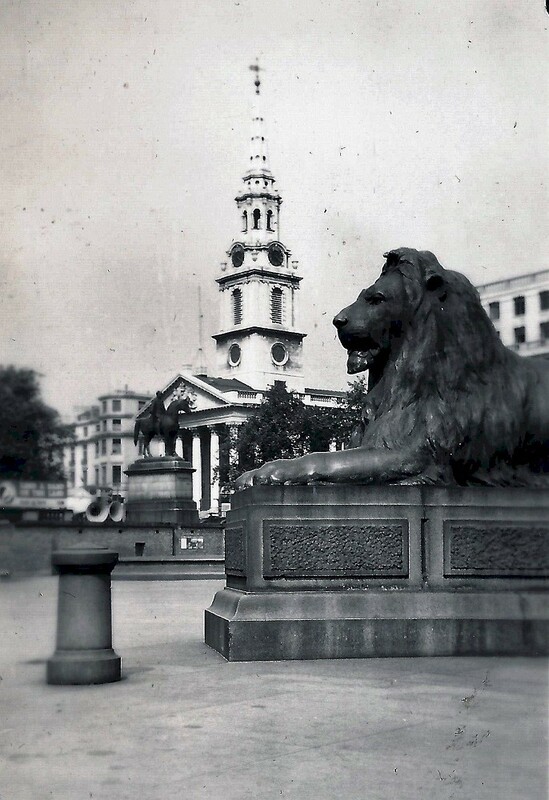 She left there on 15 Mar 1945 for Saint John, where she was under refit until 22 Jun 1945, then proceeded to Sydney and was paid off on 18 Jul 1945. 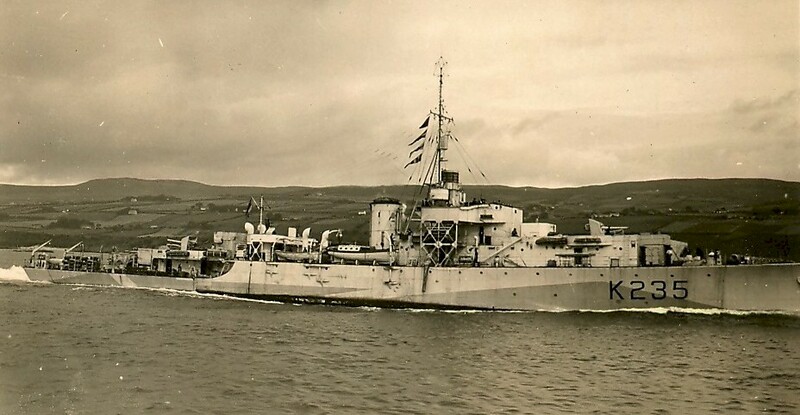 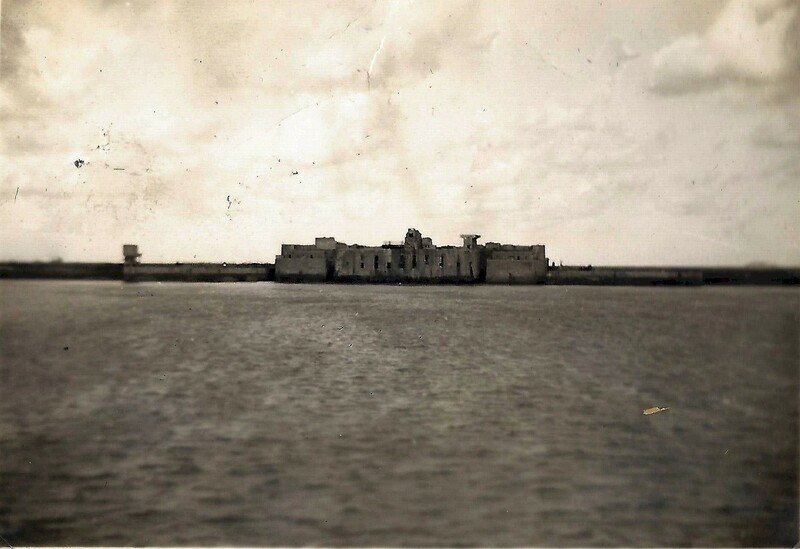 She was sold for mercantile use in 1946 and renamed North Shore, later passing into Greek registry for Mediterranean passenger service until the name of Lemnos. 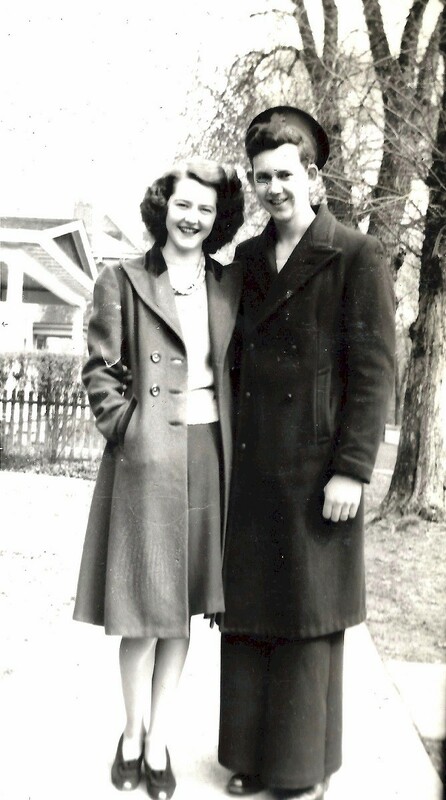 She was broken up ten years later. 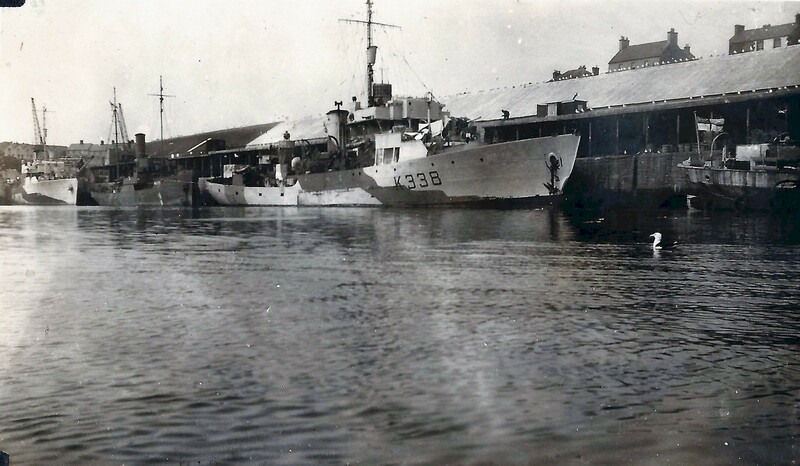 Top photo: HMCS Lindsay K338 alongside the fish jetty in Milford Haven, South Wales on 06 Aug 1944, Note the damaged bow from a collision with a trawler off Ireland on 20 May 1944. 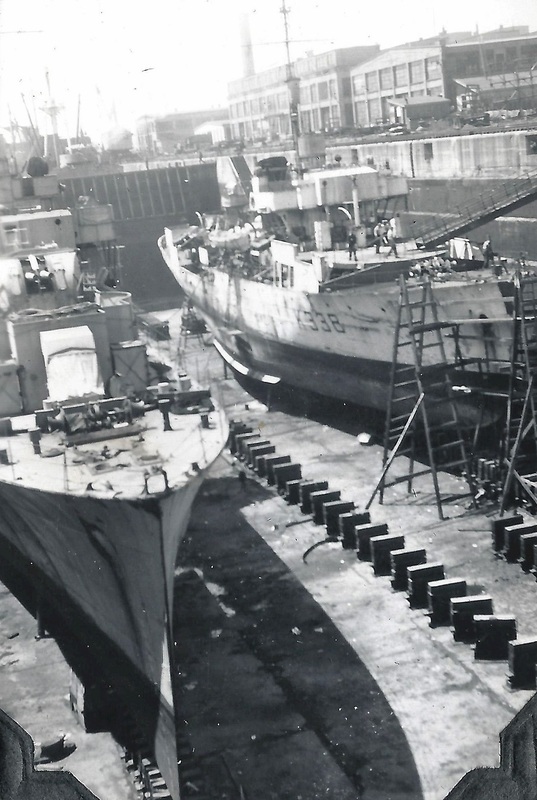 Bottom photo: HMCS Lindsay K338 in dry dock having her bow repaired. 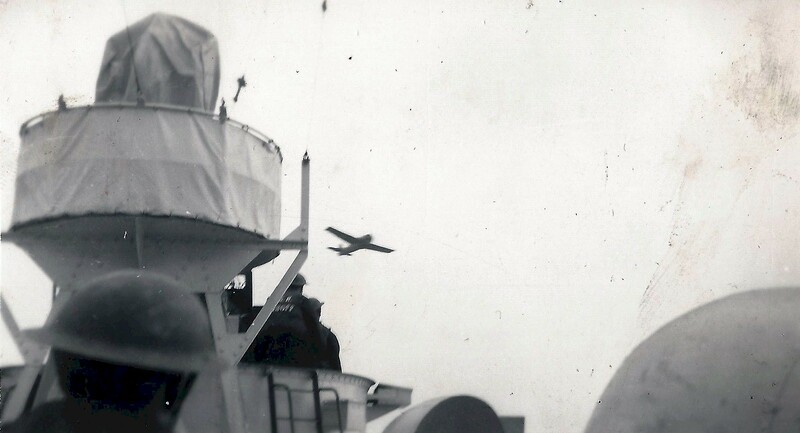 Lockheed Venture coastal patrol plane flying past HMCS Lindsay K338 - Starboard bridge 20 mm Oerlikon in foreground. 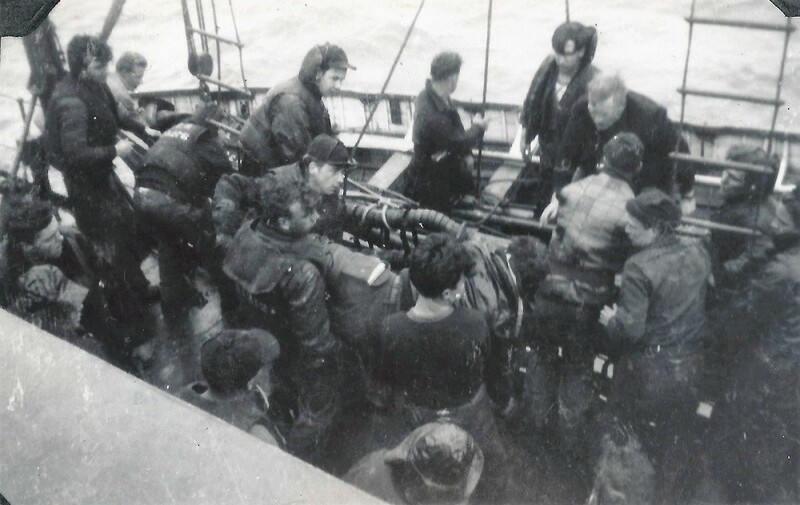 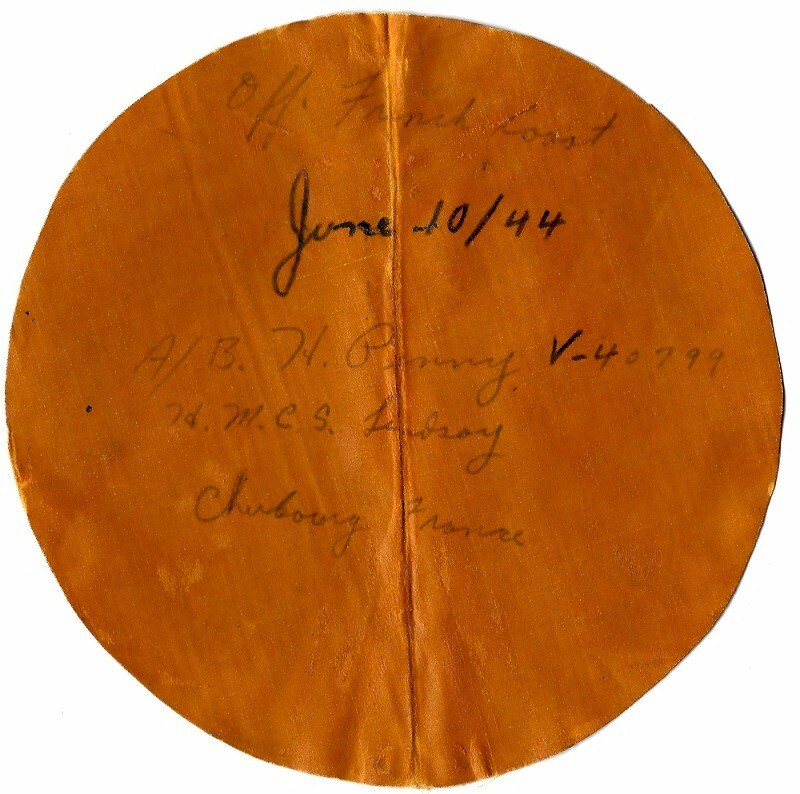 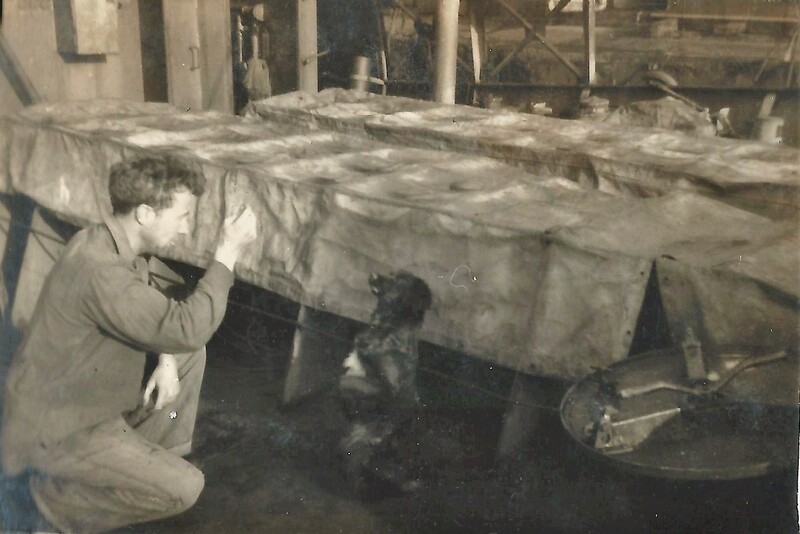 A life raft was found off the coast of France during the Normandy invasion. 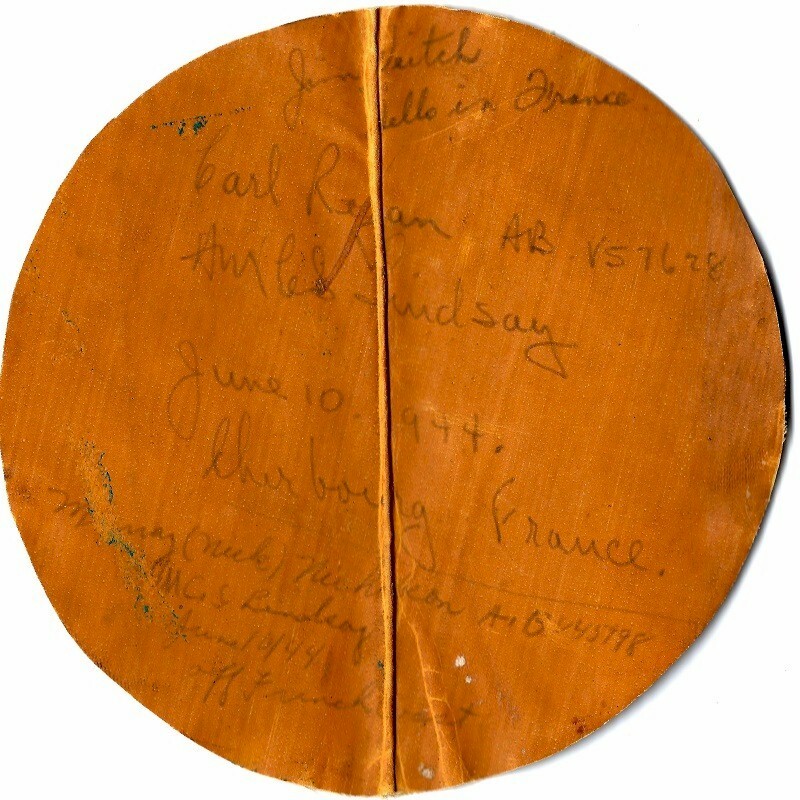 Pieces were cut off and autographed. 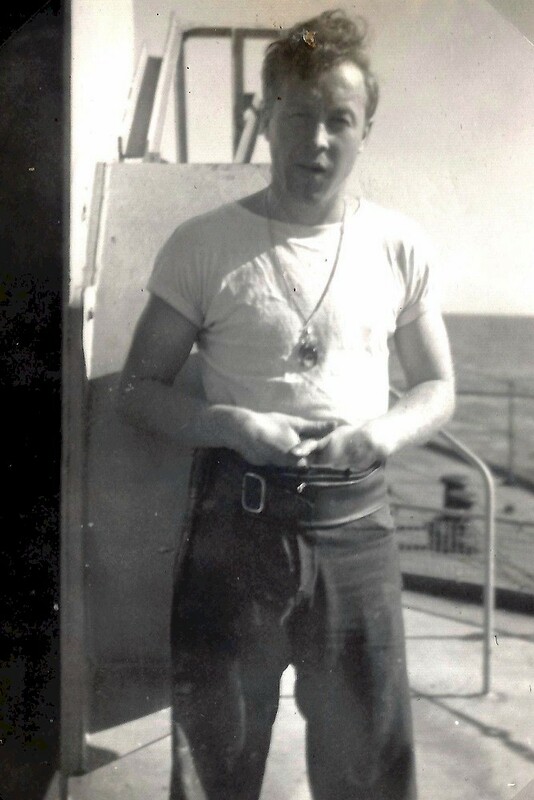 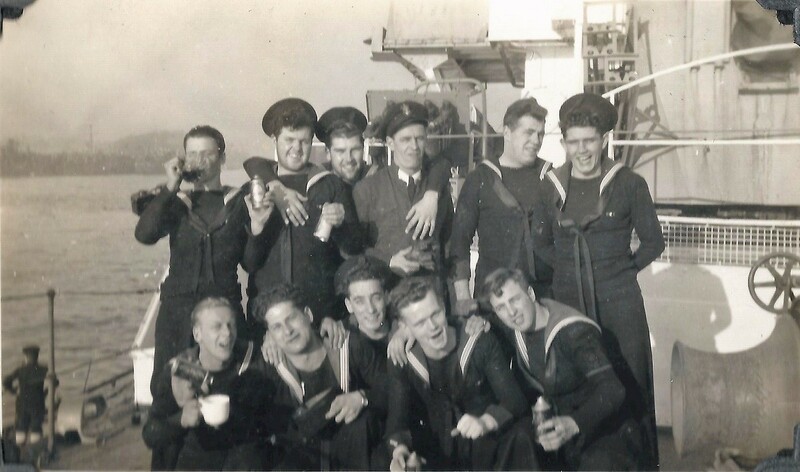 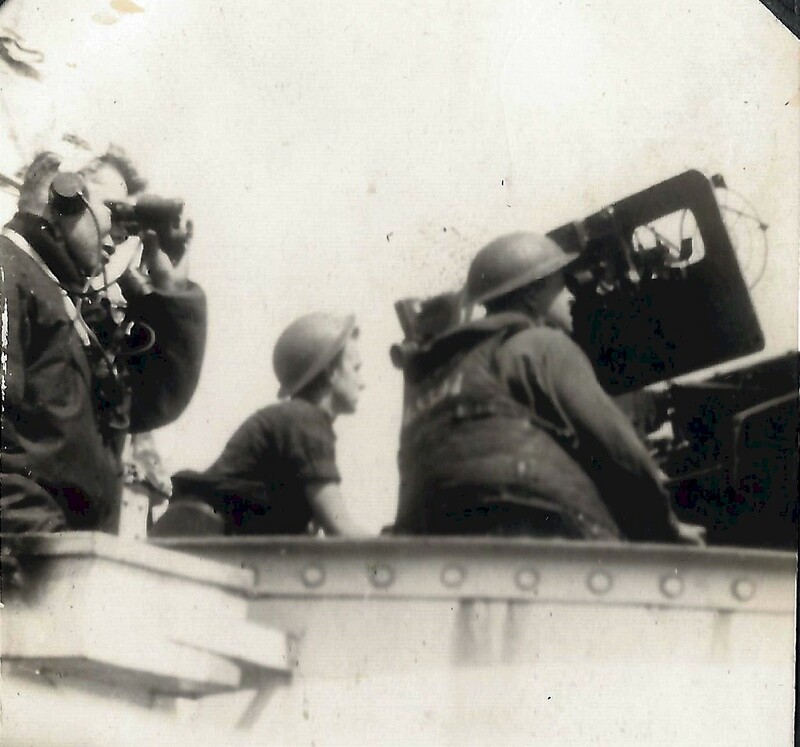 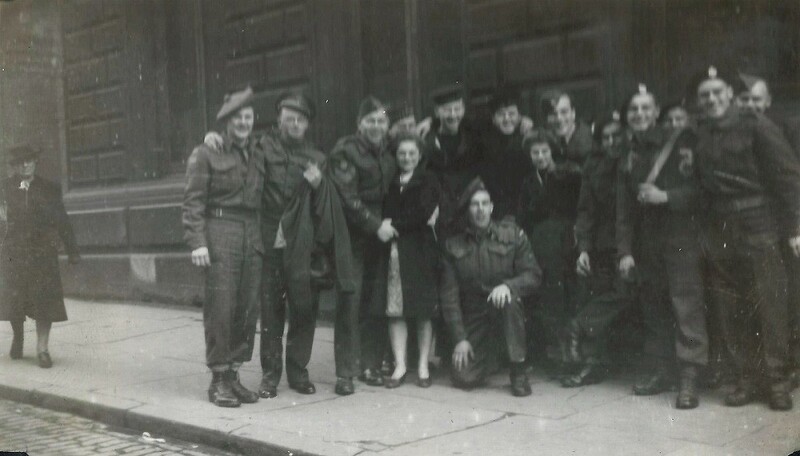 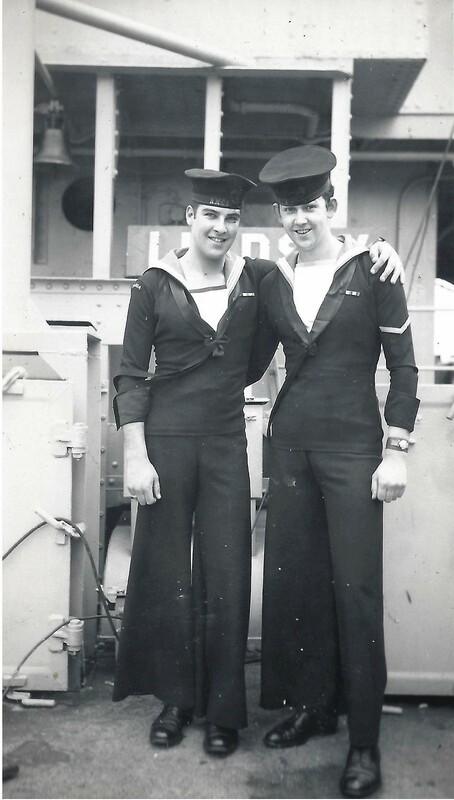 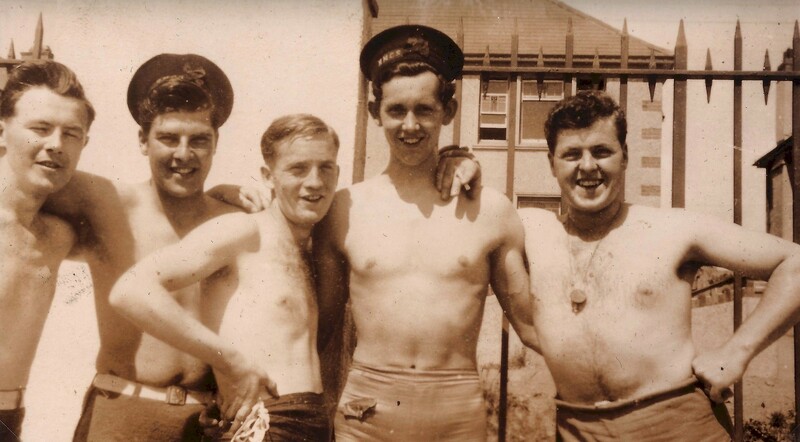 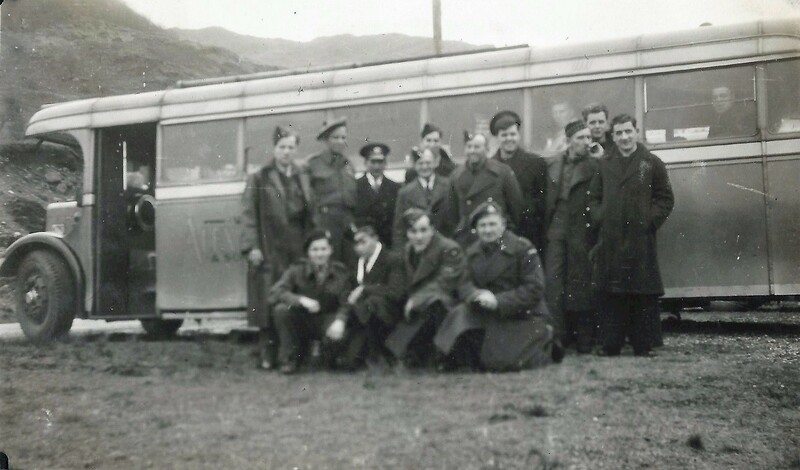 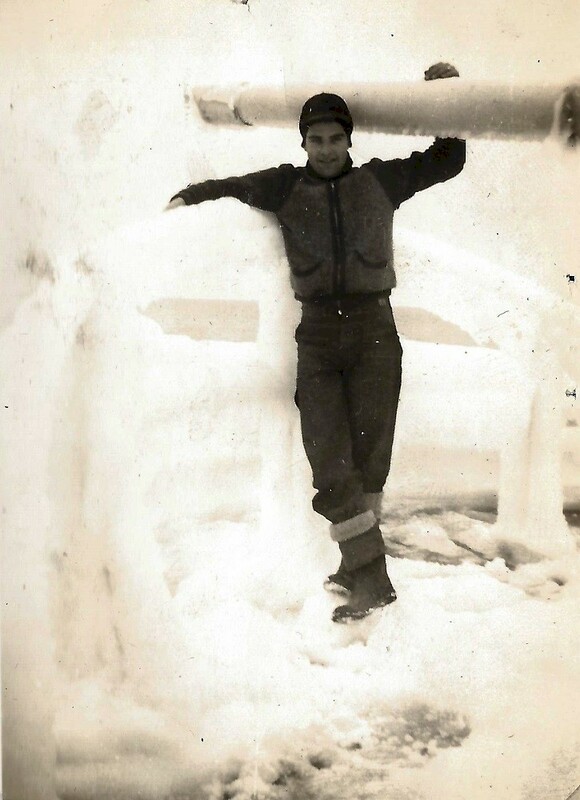 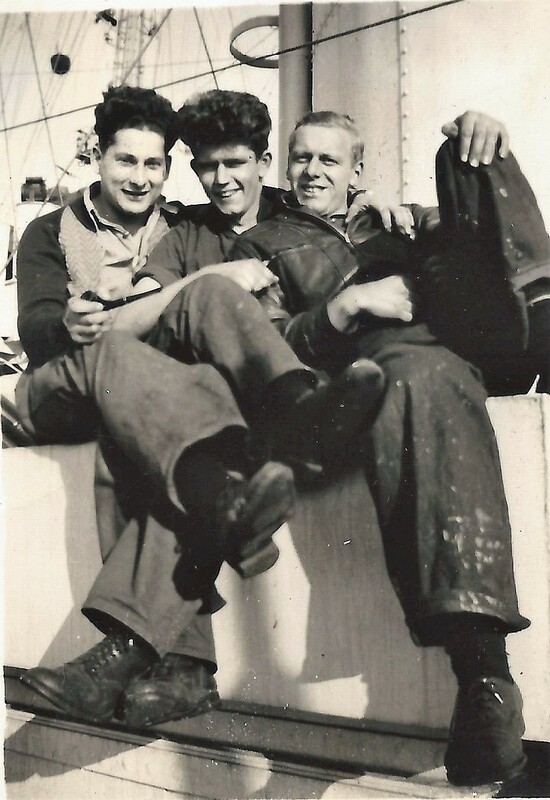 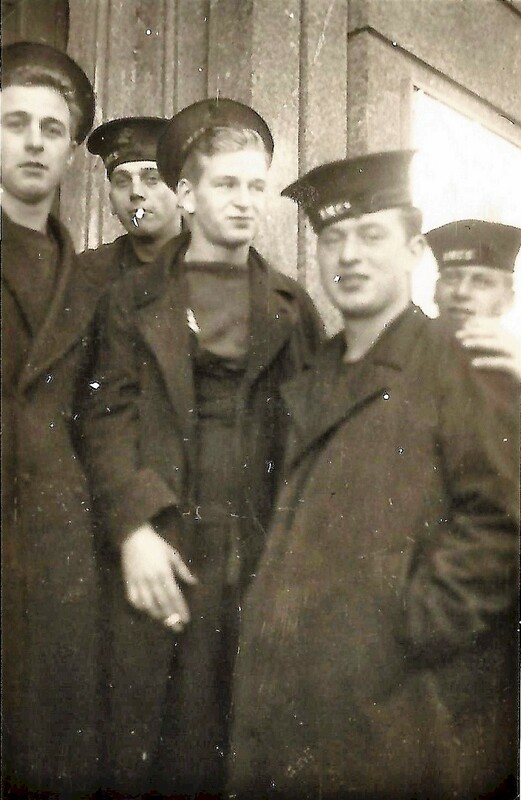 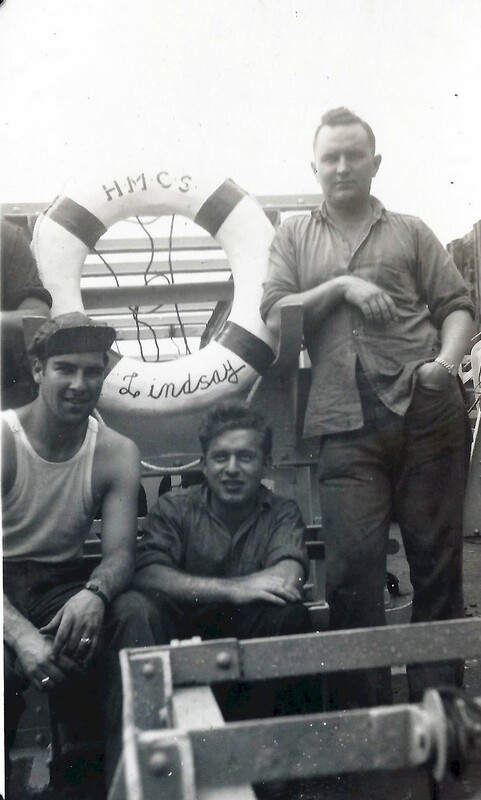 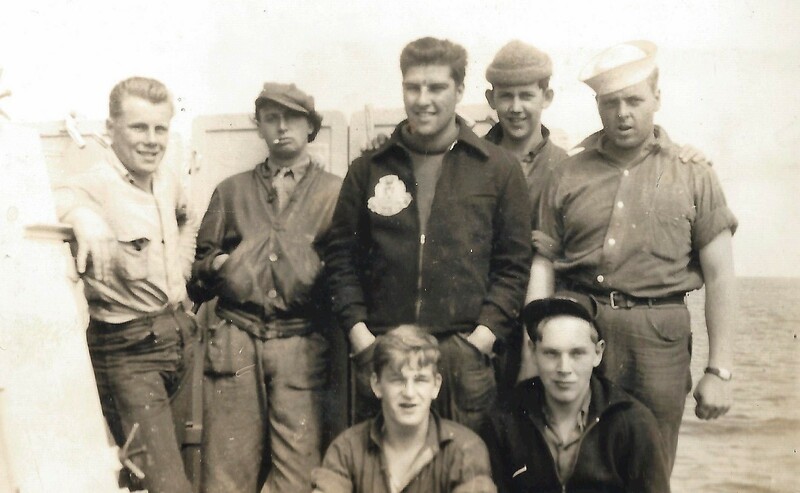 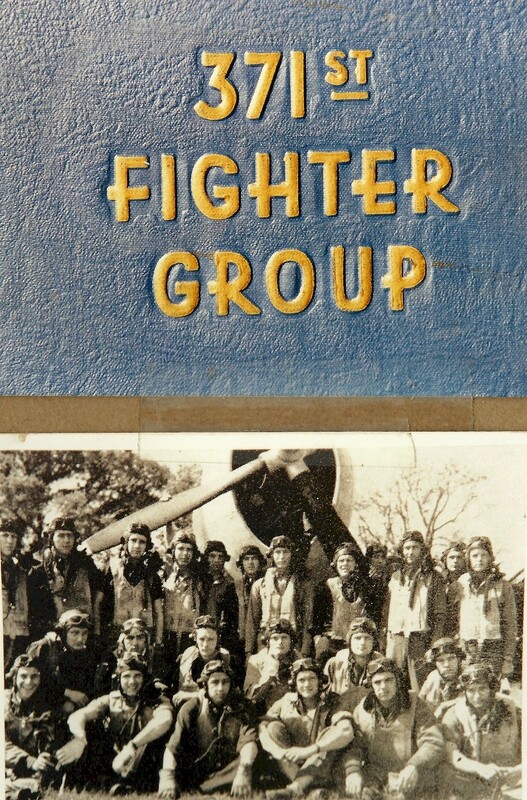 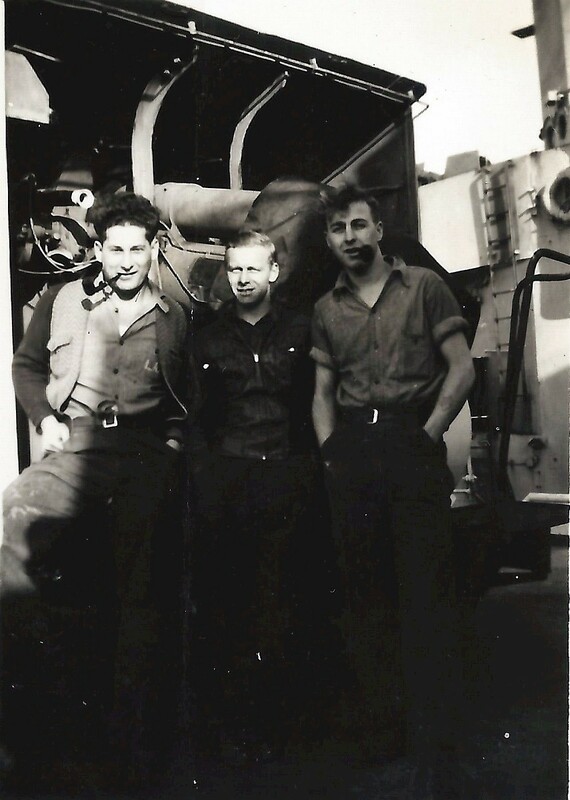 Jim Veitch "Hello in France"
Boat crew of HMCS Lindsay K338, Rescue downed U.S. Thunderbolt airman Lieut. 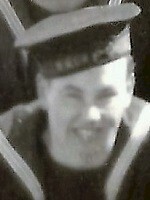 Robert M. Meade. 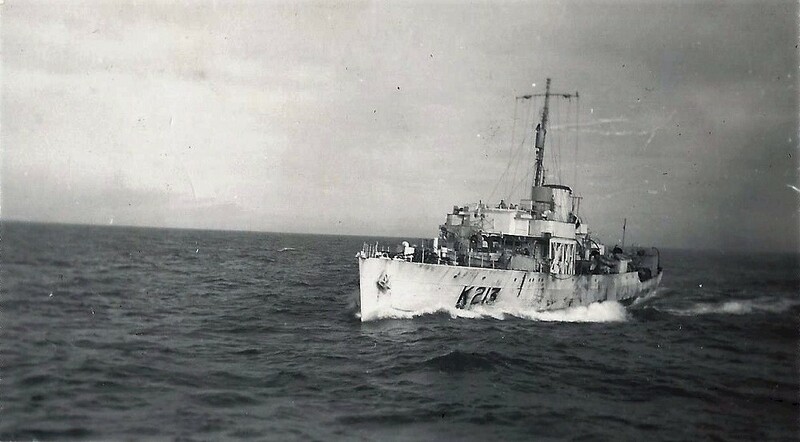 HMCS Lindsay K338 entering St John's, Newfoundland. 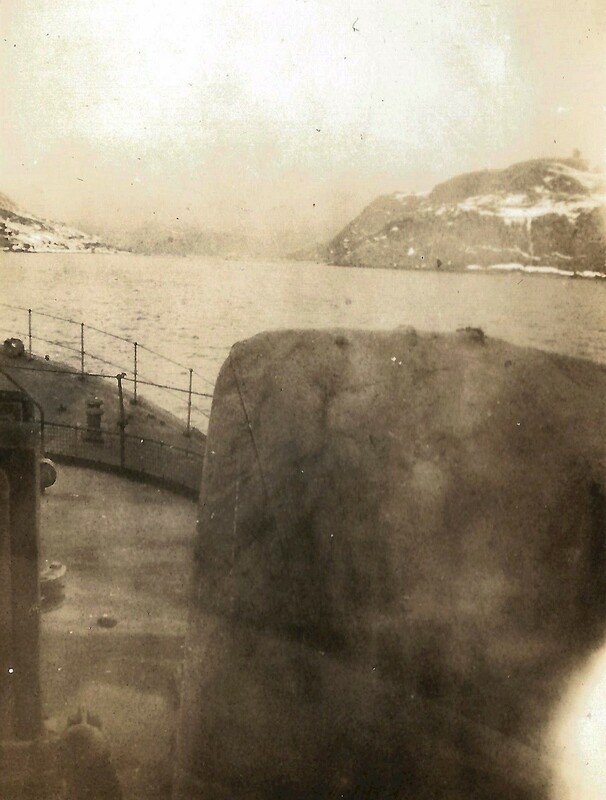 Cabot Tower on Signal Hill on the right. 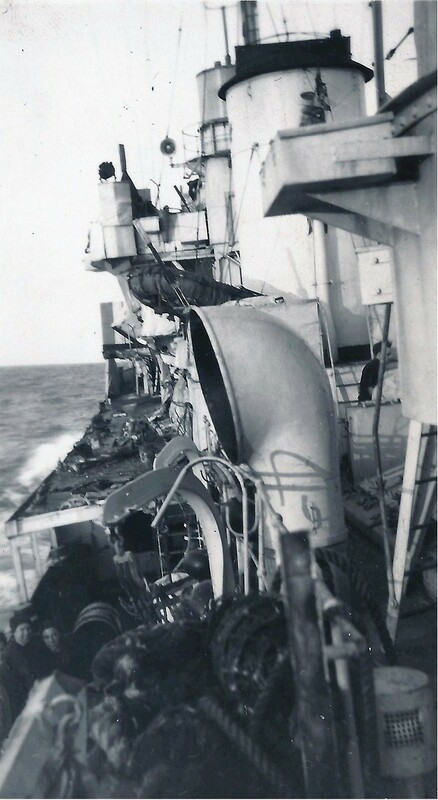 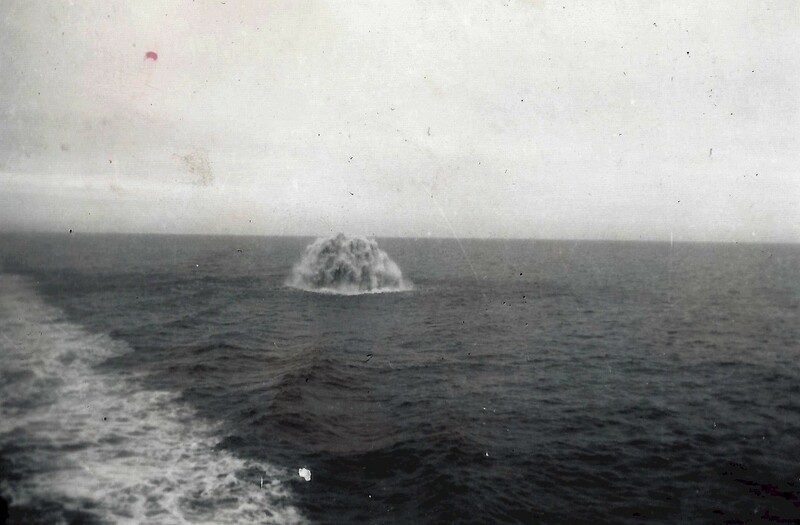 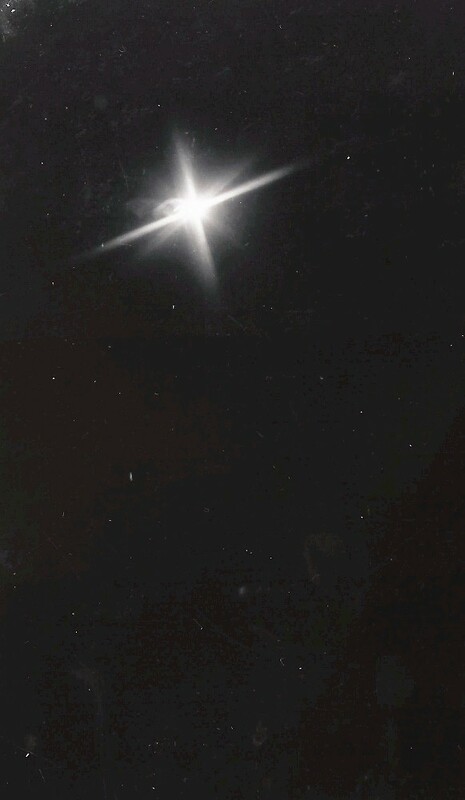 Star shell fired by American ship while we were engaging E-boats. 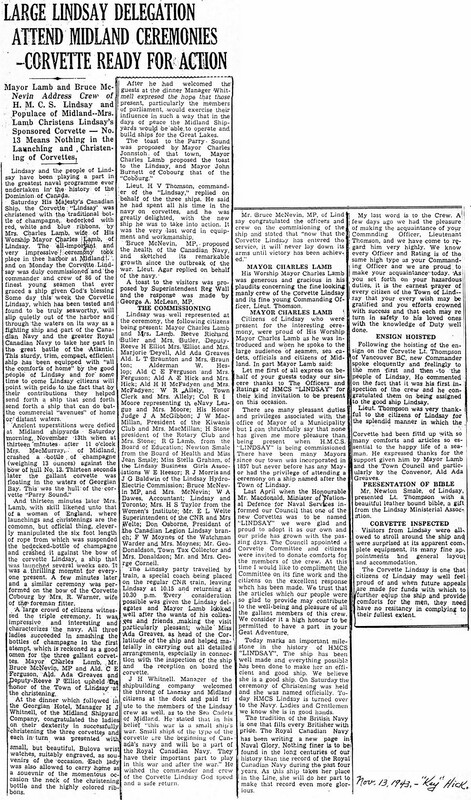 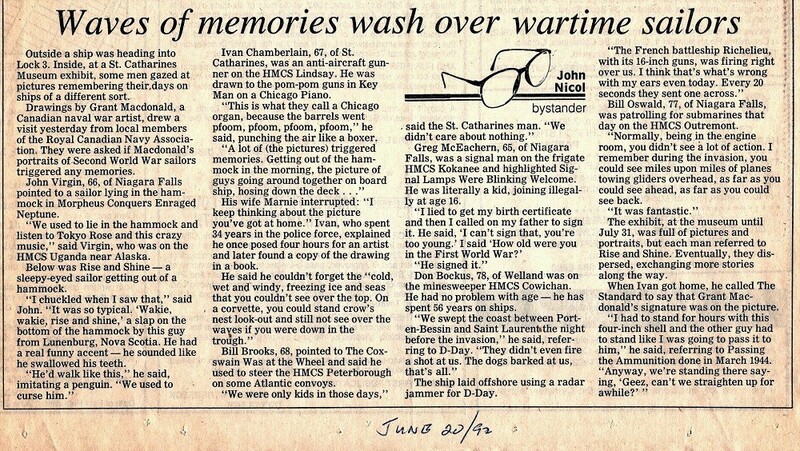 Newspaper article on collision between HMCS Lindsay and a destroyer. 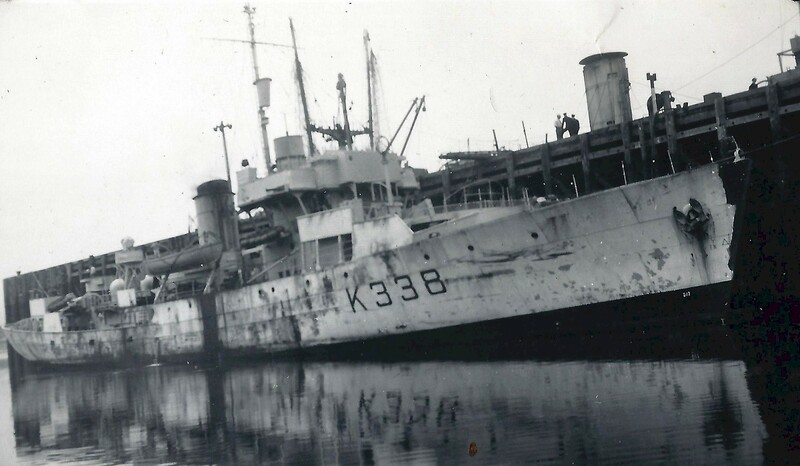 Having returned to Canada following temporary repairs in the UK after her collision with HMS Brilliant, HMCS Lindsay K338 is alongside at Saint John, NB preparing for refit. 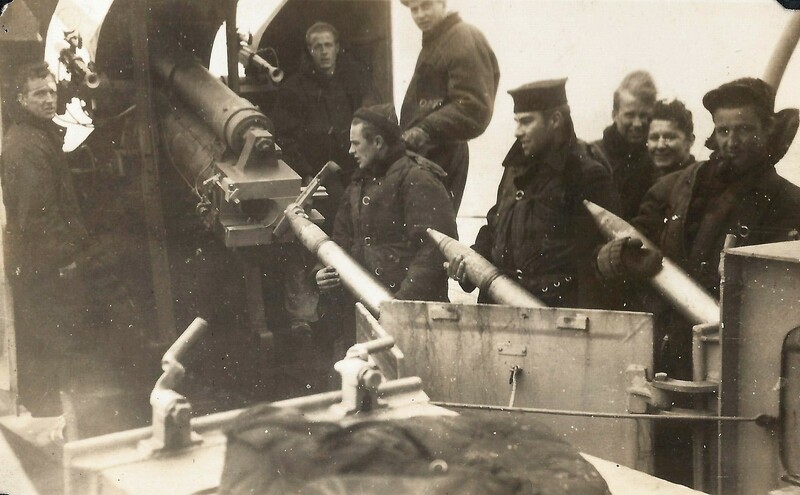 Note that her 4-inch gun has been removed. 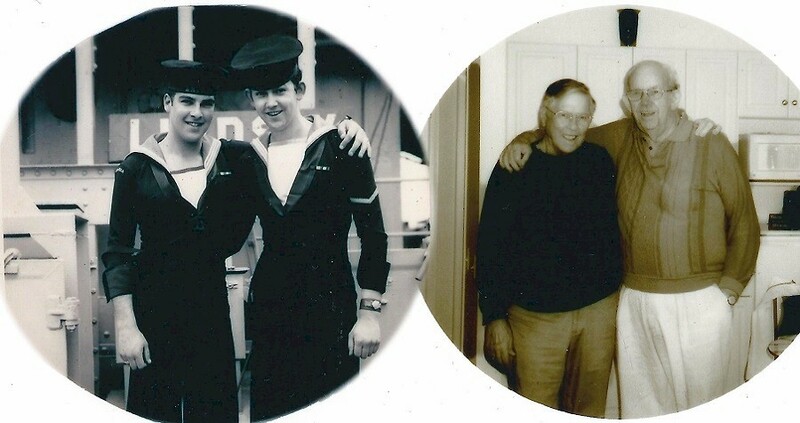 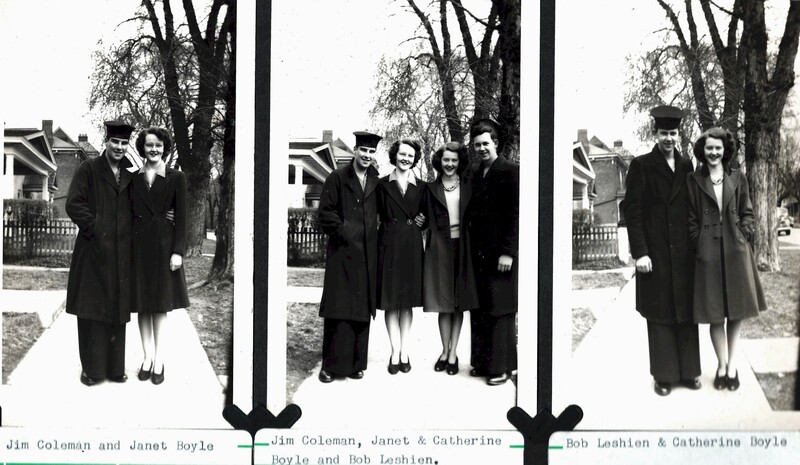 (1) Ivan and his mother Uraina Olga Chamberlain - Duke St (2) Ivan Chamberlain with his father Edward circa 1944 (3) Ivan Chamberlain and sister Norma - Duke St (4) Ivan Chamberlain, Bill Campbell, and unknown (5) Jim Coleman and Bob Leshien with Janet and Catherine Doyle (how two shipmates and best friends became brother's-in-law) (6) Catherine Boyle and Bob Leshien - Duke St (7) Ivan Chamberlain with Janet and Catherine Doyle (8) Jim Coleman, Bob Leshien and Ivan Chamberlain - Duke St (9) Ivan Chamberlain with L.A.C. 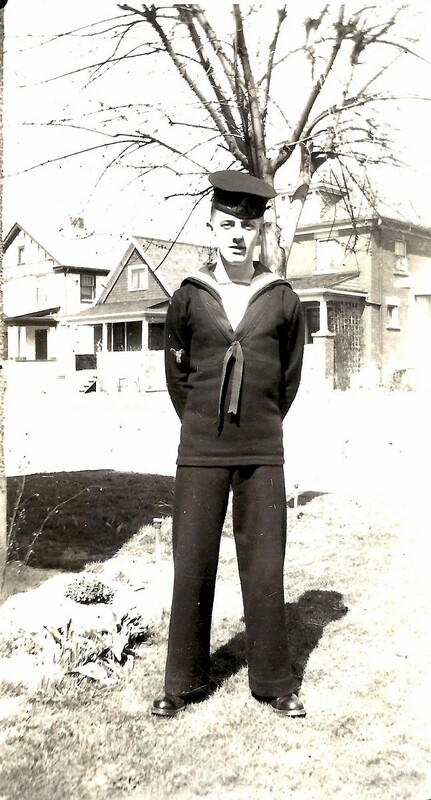 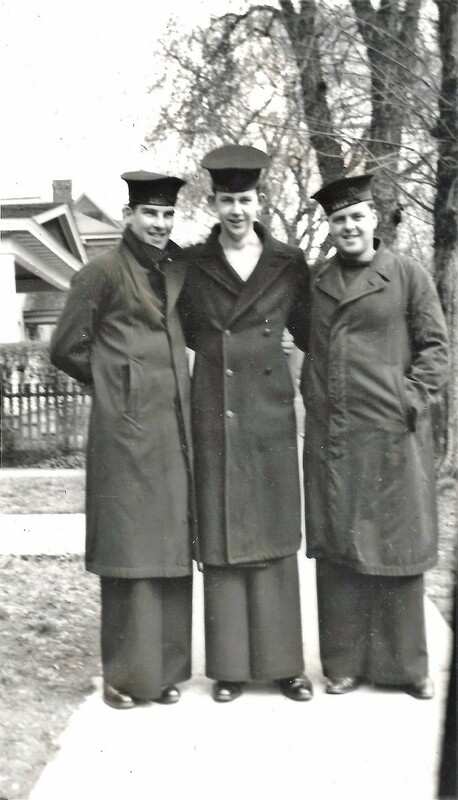 Alf Gadsby Taken at 152 Ontario St, St. Catharines, March 25, 1945 (10) Stoker George Ward - York St.
AB James (Jim) Veitch and other HMCS Lindsay sailors commended for impromptu V.E. 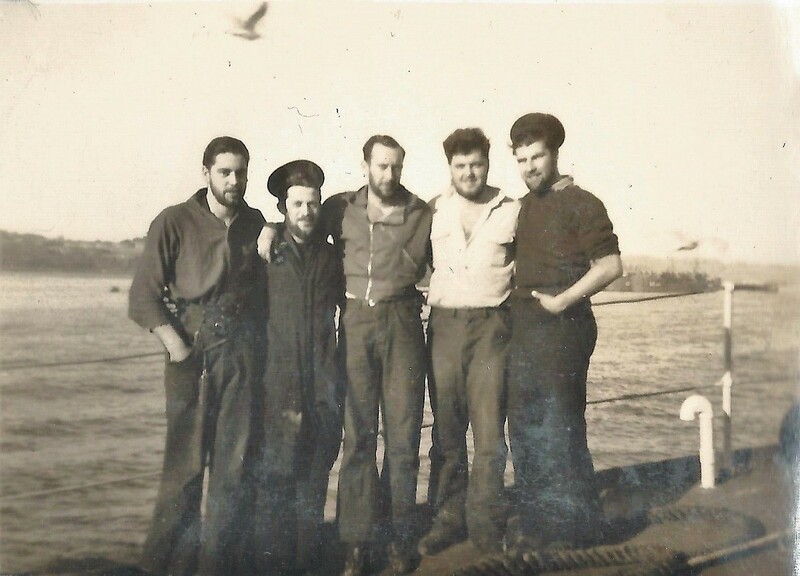 Day concert in Saint John, NB. 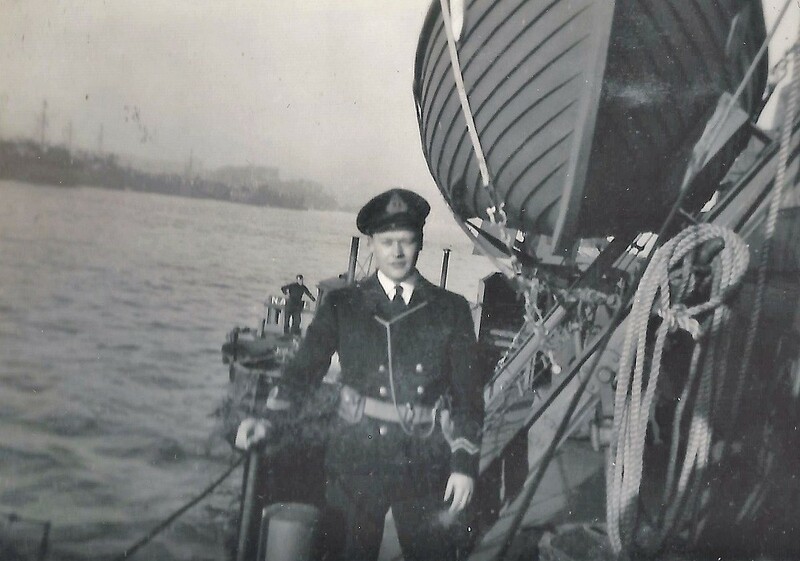 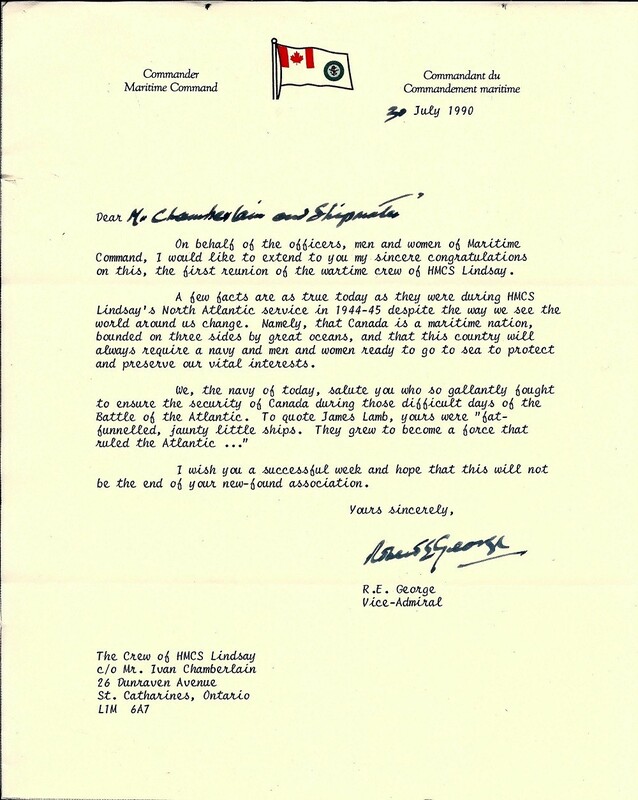 The letters and documents below are from the collection of Ivan Chamberlain who was a gunner and seaman on board HMCS Lindsay during WW2. 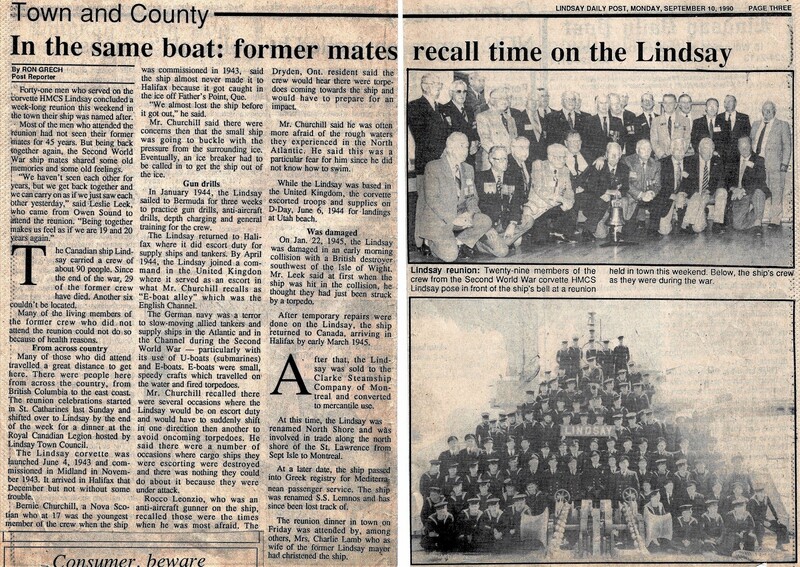 Mr. Chamberlain organized the first reunion of the Lindsay's crew that took place in Lindsay, ON in Sep 1990. 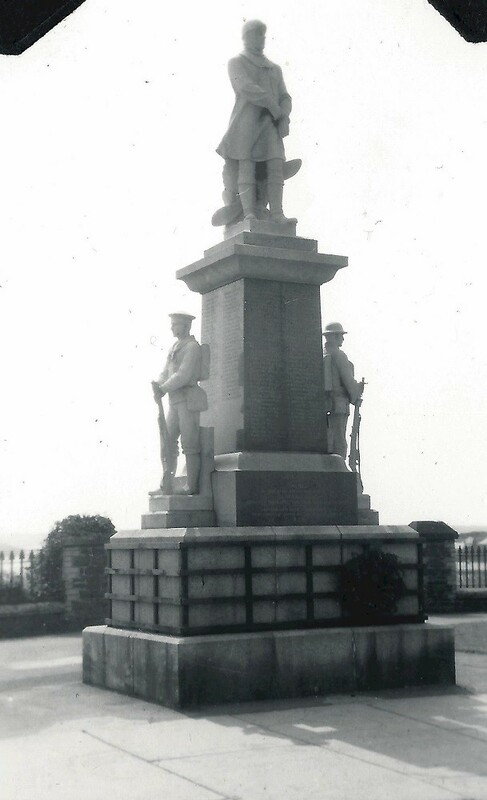 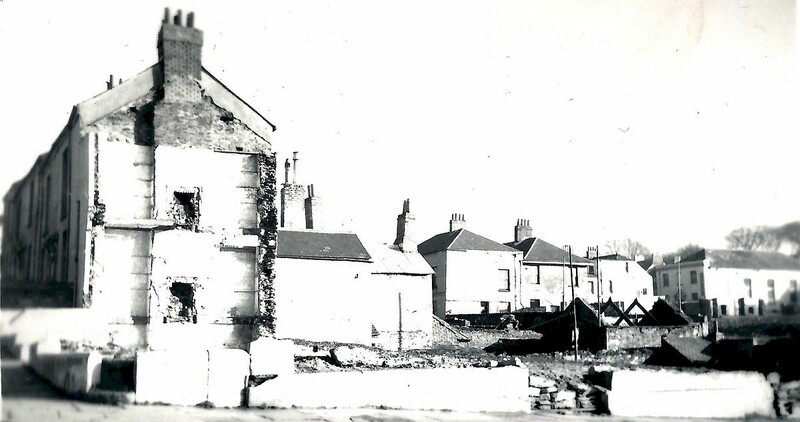 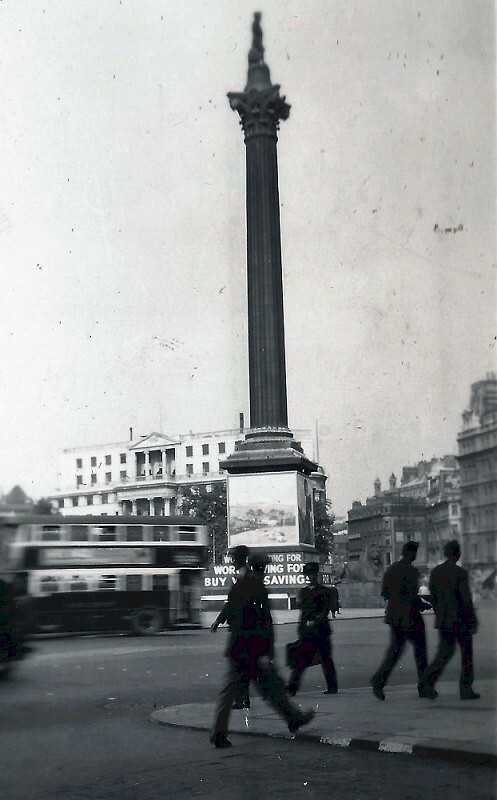 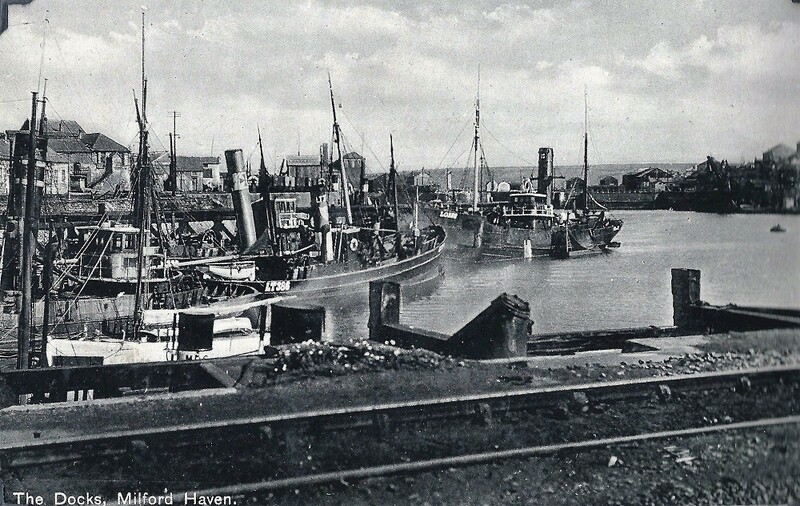 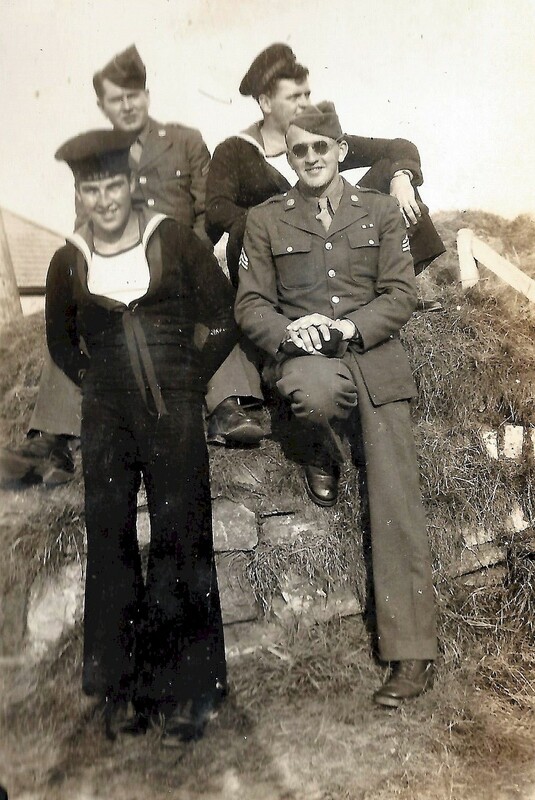 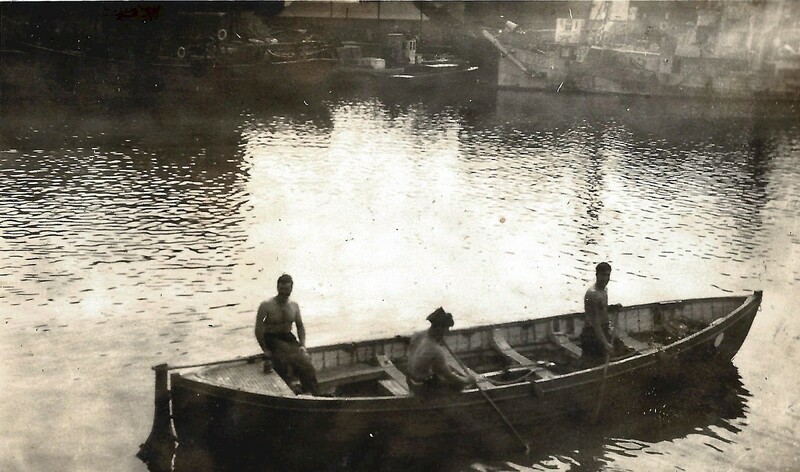 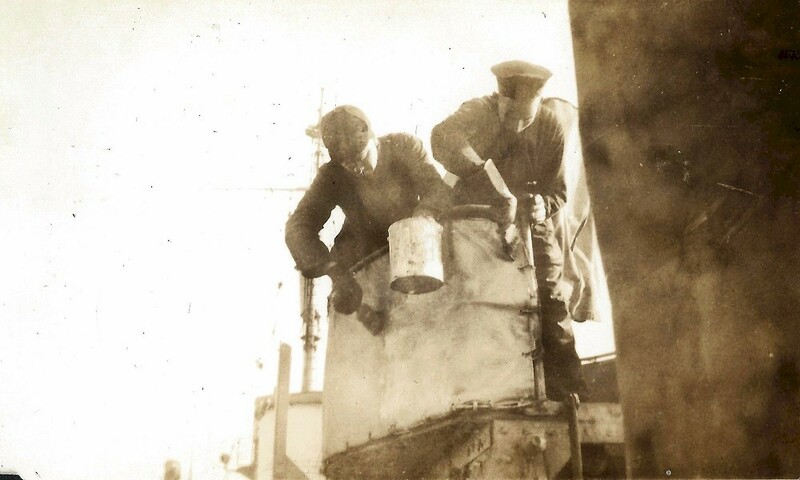 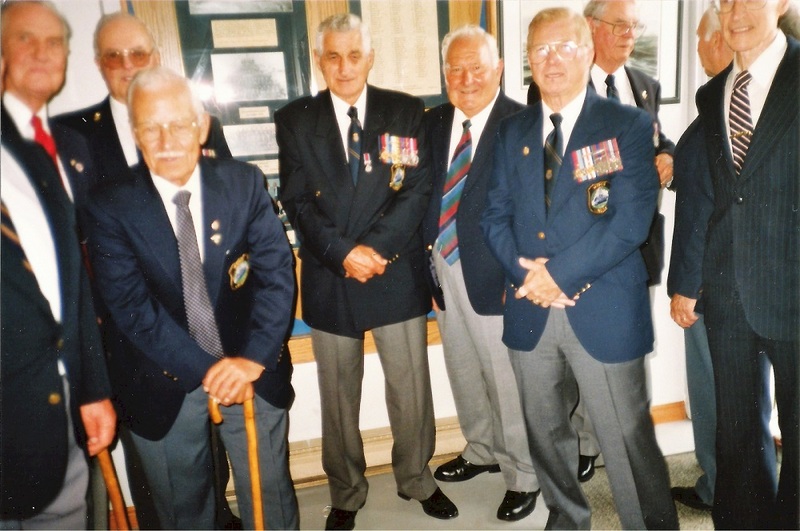 The documents below include their post reunion correspondence and the creating of a memorial for their ship. 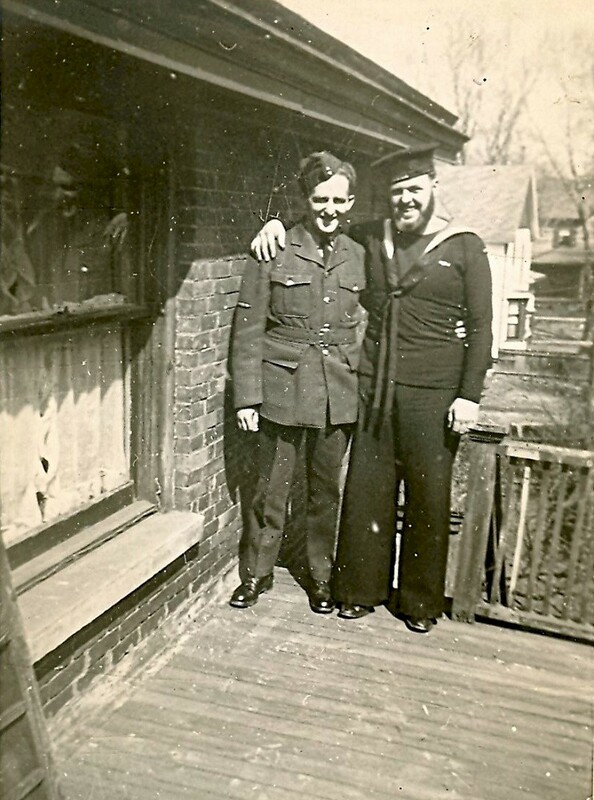 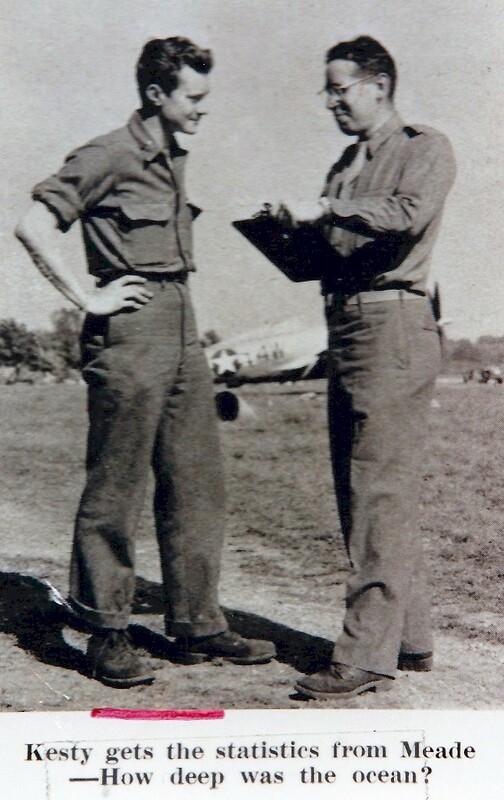 In the lead up to the reunion, Ivan Chamberlain tried to contact Lt Robert Meade, the US pilot that was rescued by HMCS Lindsay's crew.  Regretfully he had passed away many years earlier. 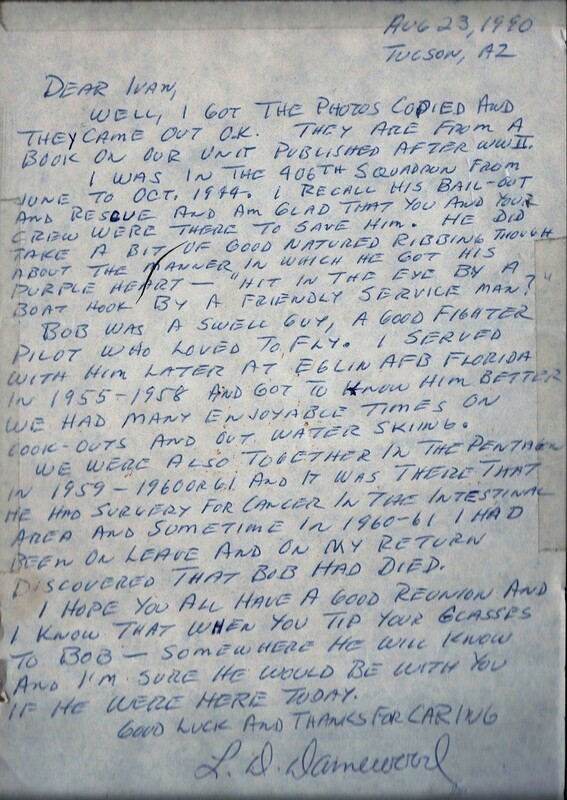 Herewith is the information sent by a friend of his and fellow pilot, L.D. 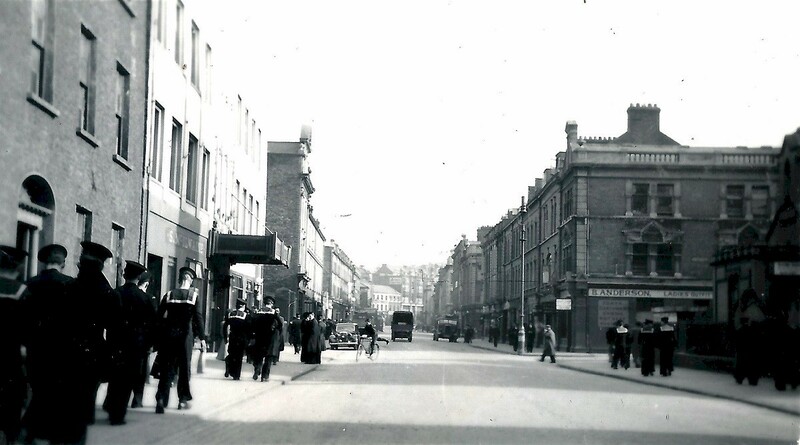 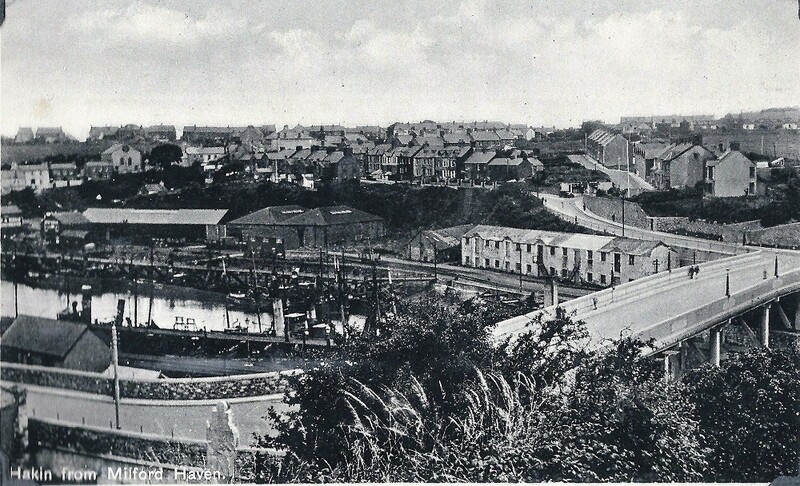 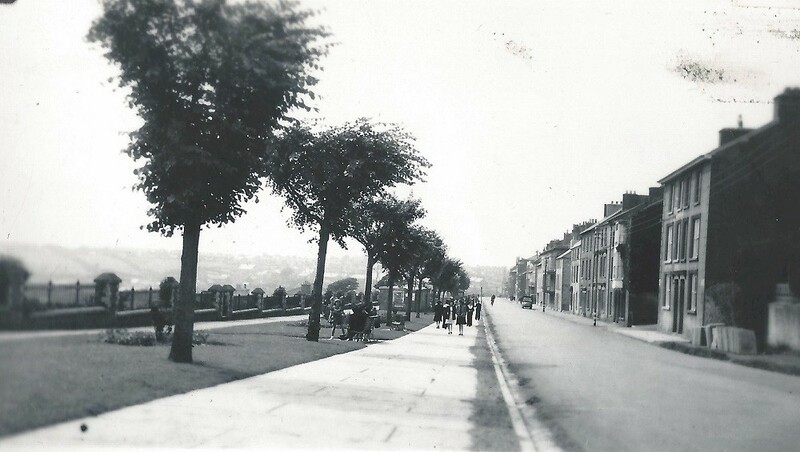 Damewood. 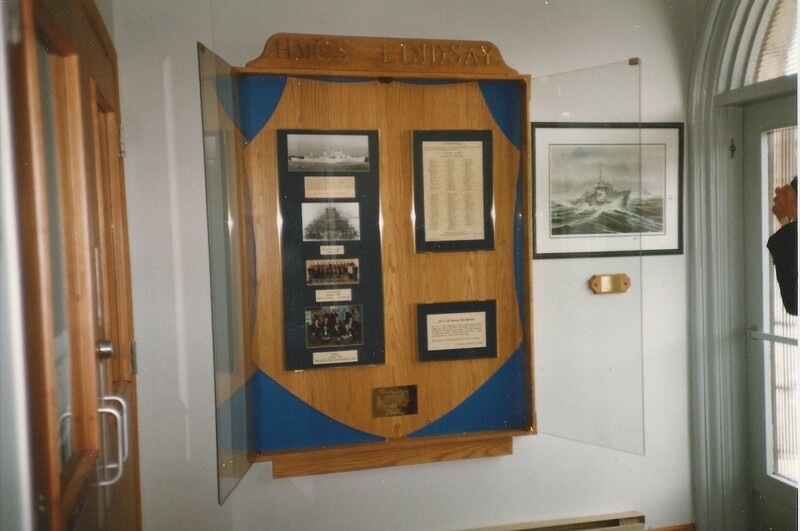 A memorial designed by former HMCS Lindsay crew members. 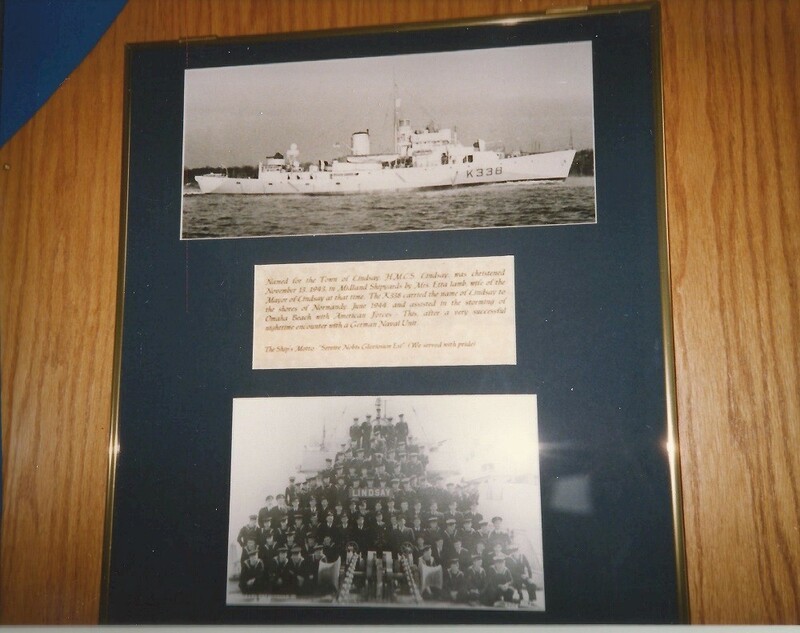 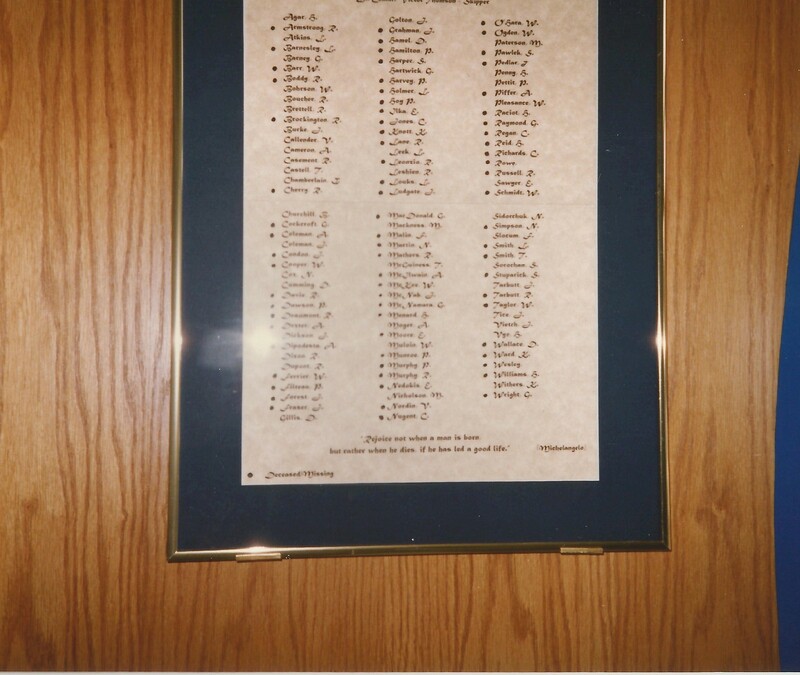 It is currently on display in Lindsay's old city hall (green building), near the entrance way. 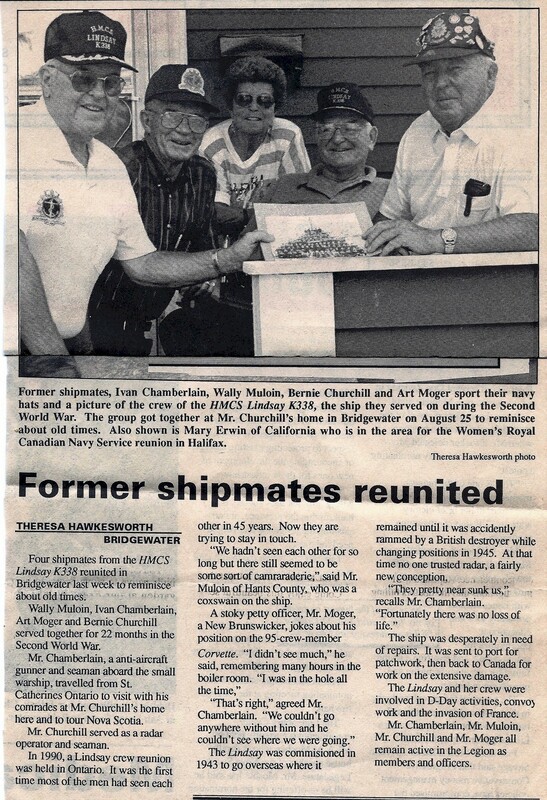 Former HMCS Lindsay crew members Ivan Chamberlain, Wally Muloin, Bernie Churchill and Art Moger get together in Bridgewater, NS - mid 1990. 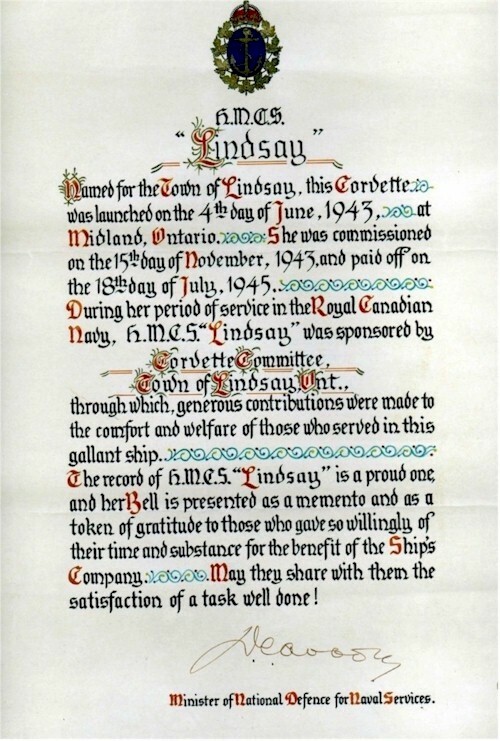 Certificate documenting the presentation of the ship's bell from HMCS Lindsay to the town of Lindsay, Ont.